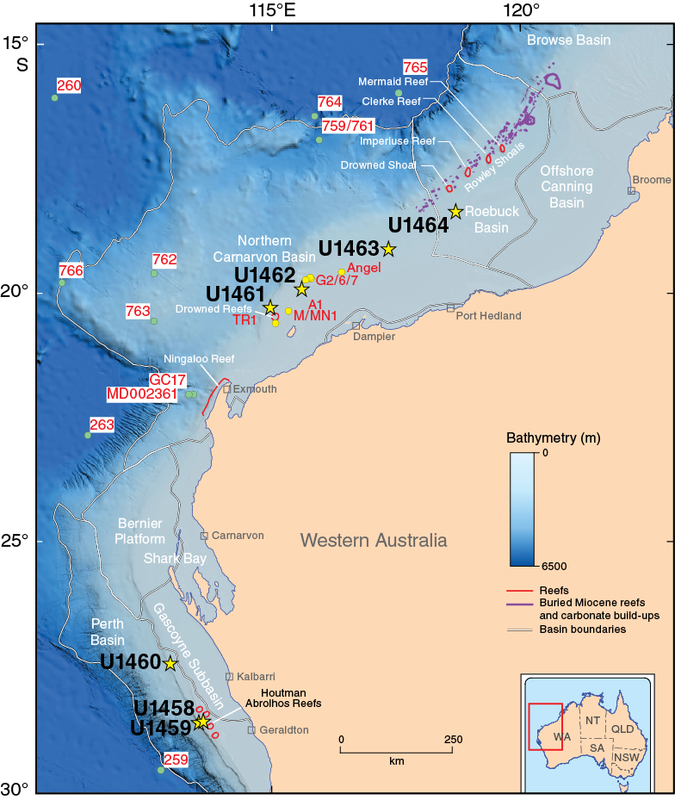 International Ocean Discovery Program (IODP) Site U1459 lies in the northern part of the Perth Basin, about 1 nmi seaward of Site U1458 and the Houtman-1 industry well on the northern Rottnest shelf (James et al., 1999; Collins et al., 2014). 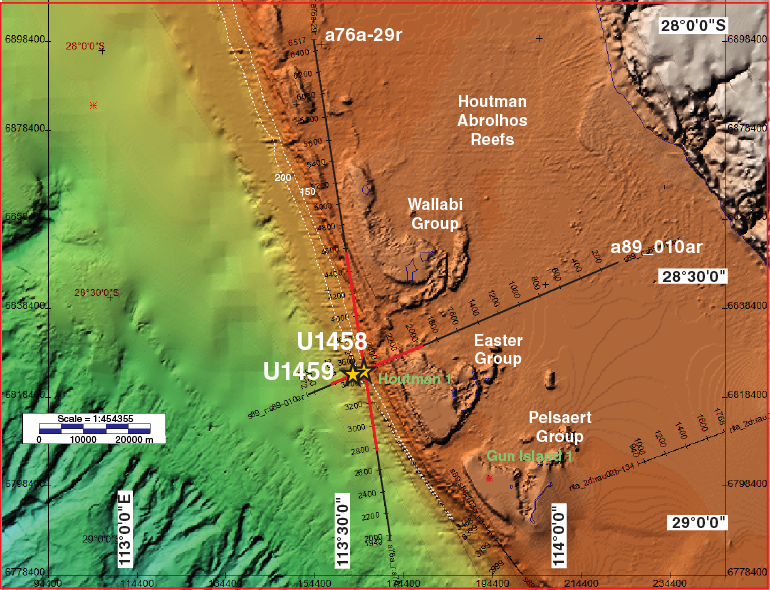 Site U1459 was originally intended as an alternate to IODP Site U1458. The ship moved to Site U1459 after having difficulty coring the uppermost sediments at Site U1458. Like U1458, Site U1459 is directly seaward of and downdip from the Houtman Abrolhos main reef complex, which contains the most southerly tropical reefs in the Indian Ocean. Sites U1458 and U1459 represent the southernmost sites of our latitudinal transect (Figures F1, F2, F3). The objectives for Site U1459 were the same as those for Site U1458. The evolution of the Houtman Abrolhos reef complex is directly related to the path of the Leeuwin Current. 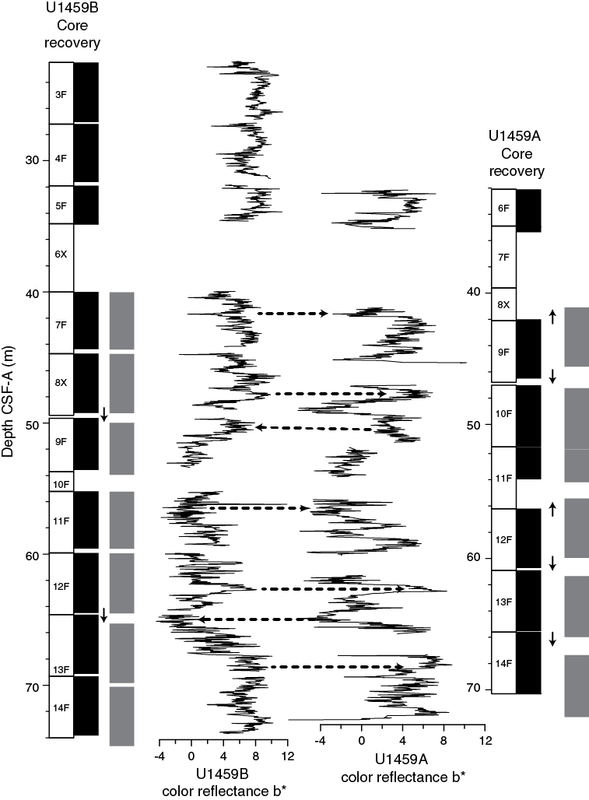 Dating of sediments cored at Site U1459, coupled with seismic correlation, will provide insight into the pre-Quaternary history of these reefs and a long-term perspective on Leeuwin Current evolution at the tropical/subtropical boundary off Western Australia. In addition, it has been suggested that subsidence rates over the last 140 ky were low compared to those of the Carnarvon Basin reefs (Collins and Testa, 2010). Subsidence analyses of the shelf wedge drilled at this site will extend this record and allow more precise modeling of dynamic subsidence along the western margin of Australia. An additional objective was to use any finer grained facies in this section to yield a Pliocene–Pleistocene record of the onset and variability of the southern Australian winter-dominated rainfall regime. After a 1.25 h (1 nmi; average speed = 0.8 kt) transit in dynamic positioning mode from Site U1458, the vessel arrived at Site U1459 at 1540 h on 5 August 2015. The vessel was offset 75 m to the west of the site coordinates and an acoustic beacon was deployed (1553 h on 5 August). After offsetting the vessel from the beacon, drill floor activities commenced. Site U1459 consisted of three holes (Tables T1, T2). The original plan called for three advanced piston corer (APC) holes to refusal with the last two holes being extended by the extended core barrel (XCB) system to 330 meters below seafloor. It became immediately apparent in Hole U1459A that the APC system would not penetrate the surface formation. After breaking the first APC core barrel, the half-length APC (HLAPC) core barrel was run and recovered 0.1 m of core. Fourteen cores were subsequently recovered from Hole U1459A using both the HLAPC and XCB systems (70.3 m cored with 30.59 m recovered). The first hole was challenging, with multiple hard layers interspersed through the upper 55 m, and resulted in 44% overall recovery for the entire hole. After a stuck core barrel forced the abandonment of Hole U1459A at 70.3 m drilling depth below seafloor (DSF), a detailed coring plan for Hole U1459B was developed using information gained from Hole U1459A. The alternating use of the HLAPC (for soft intervals) and XCB (for harder intervals) systems in Hole U1459B greatly increased core recovery (78%). Deeper than ~55 m DSF, HLAPC coring encountered no resistance and continued to 218.9 m DSF. The third hole became necessary when the XCB system failed at 233.0 m DSF, destroying an XCB cutting shoe in the process. The drill string was recovered and a rotary core barrel (RCB) bottom-hole assembly (BHA) was assembled with a C-4 coring bit and a mechanical bit release. Hole U1459C was started and drilled without coring to 205.8 m DSF. The center bit was pulled and RCB coring began at 205.8 m DSF, terminating at 400.0 m DSF (194.2 m cored with 22.6 m recovered [11%]). Two separate logging tool runs were completed with the triple combination (combo) and Formation MicroScanner (FMS)-sonic. Table T1. Operations summary, Site U1459. Download table in .csv format. Table T2. Site U1459 core summary. Download table in .csv format. View PDF table. The total time spent on Site U1459 was 6.9 days. Overall, 484 m were cored with 224.96 m recovered, resulting in a core recovery of 46.5% for Site U1459, which utilized the HLAPC, XCB, and RCB systems. Hole U1459A (28°40.2606′S, 113°33.5376′E) began on 5 August 2015 with preparations for coring. A full-length nonmagnetic core barrel was picked up and run into the hole to spud Hole U1459A. On the first core barrel run to establish the mudline, the core barrel came back empty. The bit depth was repositioned, and the second core barrel made contact with the seafloor but failed at the center threaded connection. The HLAPC nonmagnetic core barrel was then prepared, the bit was lowered to tag the bottom, and a water depth of 192.3 meters below sea level (mbsl) was recorded. Hole U1459A was started at 1920 h on 5 August. Only 0.01 m was recovered in Core 356-U1459A-1F. After determining that the seafloor was too firm for either the APC or HLAPC system, the XCB system was picked up and deployed. A 9.6 m interval was cored and recovered only 0.63 m of core in 120 rotating minutes (Core 2X). Unfortunately, in order to make a connection with poor hole conditions, the bit had to clear the seafloor. After redrilling and coring an additional 3.7 m to ~13.5 m DSF, hole conditions once again forced us to pull above the seafloor. Coring continued with the XCB system to 32.1 m DSF (Core 5X) with poor recovery (2%). An increased penetration rate indicated that the hard formation had given way to something amenable to the HLAPC. The HLAPC was picked up and Cores 6F and 7F recovered (103% and 10% recovery, respectively). While shooting Core 7F, another hard formation was encountered at 34.9 m DSF. The XCB core barrel was again deployed and advanced 2.5 m without recovery. With the change in penetration rate, the HLAPC was again deployed, recovering Cores 9F through 14F to 70.3 m DSF. The core barrel containing Core 14F became stuck in the BHA, and after attempting to free it for more than 1 h, the BHA was pulled to the rig floor to recover the core barrel. Hole U1459A ended at 2135 h on 6 August. The total time spent on Hole U1459A was 29.75 h.
After offsetting the vessel 20 m north of Hole U1459A, a coring plan was prepared for Hole U1459B (28°40.2519′S, 113°33.5375′E) based on the recovery and penetration rates from Hole U1459A. Hole U1459B was started at 0025 h on 7 August 2015. After drilling down 13.5 m, the center bit was pulled and an XCB core barrel was dropped. Core 356-U1459B-2X was cut to 22.5 m DSF. The HLAPC system was then deployed for three cores. The XCB system was again deployed at 34.8 m DSF to core (6X) through another hard layer. The HLAPC system was deployed and recovered three additional cores, after which the XCB was used to core to 55 m DSF and through the last known hard layer. HLAPC coring began again and recovered Cores 11F through 46F (average recovery = 97%) to 218.9 m DSF where HLAPC refusal was called. The XCB system was deployed, and coring continued through to Core 50X. After trying to advance with Core 50X for 1 h, the core barrel was pulled and the XCB cutting shoe was determined to have reached refusal depth. Hole U1459B was completed at a final depth of 233.0 m DSF. The drill string was recovered with the top drive still installed and cleared the seafloor at 1345 h on 8 August. Hole U1459B ended at 1640 h. The total time spent on Hole U1459B was 43.25 h. Overall, 219.5 m was cored and 171.77 m recovered (78.3%); however, 189.7 m of this hole was cored with the HLAPC with 170.93 m recovered (90.1%), whereas the XCB system cored 29.8 m with 0.84 m recovered (2.8%). After offsetting the vessel 20 m north of Hole U1459B, preparations were made for RCB coring. A drilling/coring plan was prepared for Hole U1459C based on the total depth of Hole U1459B and the recovery toward the end of the hole with the APC/XCB system. Hole U1459C (28°40.2398′S, 113°33.5365′E) was started at 2225 h on 8 August 2015. After a 205.8 m drilled interval, the center bit was pulled. Two sections (~300 cm) of material were found in the core liner and curated (as Core 356-U1459C-11) with the drilled interval. RCB coring began with Core 2R and continued through Core 4R to 219.6 m DSF. A nonmagnetic core barrel was dropped, but the increasing amplitude of the ship’s heave made it difficult to keep the bit on the bottom for coring. Coring was suspended with the vessel heave increasing to >4 m. The bit was pulled up off the bottom to 212 m DSF while the driller maintained circulation and rotation and worked the pipe up and down. At 1515 h on 9 August, the torque began increasing and rotation stopped. After working the stuck pipe for almost 1 h with circulation, rotation, and overpull, the pipe came free. In order to avoid a possible repeat of this event, the drill string was pulled back to 115.5 m DSF and the driller continued to circulate, rotate, and work the pipe up and down. Heave continued to increase, peaking at ~5.8 m before gradually diminishing over the next 12 h. The following day (10 August), heave had reduced to the point where it was possible to pull the empty core barrel back to the surface. A center bit was dropped and the hole was washed back to the bottom without difficulty. With good hole conditions, a mud sweep was pumped to clean the hole, the center bit was retrieved, and a core barrel was dropped. Coring resumed at 1215 h on 10 August with recovery of Core 5R from 219.6 m DSF. Coring continued for another 3.25 h, when the drill string became stuck again. After 1.25 h of working the stuck drill pipe, it came free and coring resumed. Cores 6R through 42R were recovered to a final depth of 400.0 m DSF at ~1730 h on 11 August. In total, 194.2 m was cored with 22.6 m recovered (11.6%). High-viscosity mud was circulated to clean the hole of cuttings. The hole was displaced with 120 barrels of +11 lb/gal mud. The drill string was pulled up to logging depth (72.2 m DSF), and the logging tool strings were rigged up at 2330 h on 11 August. The first tool string contained the following: magnetic susceptibility sonde (MSS), Hostile Environment Natural Gamma Ray Sonde (HNGS) (caliper only, no source), Hostile Environment Litho-Density Tool (HLDT), Enhanced Digital Telemetry Cartridge (EDTC), and logging equipment head-q tension (LEH-QT). The tools were assembled, tested, and run into the hole at 0030 h on 12 August. After the tool string exited the drill pipe, the active heave compensator was turned on. The initialization of the unit normally shocks the wireline system slightly, but because of the shallow water and the shortness of the logging string, the fluctuation in the wireline tension was excessive and resulted in the wireline coming off the sheaves of the compensator. The logging tool string was hung off with a T-bar while the wireline was put back into the sheaves and tested. The compensator software was modified slightly to be less reactive to the high heave conditions. A downlog was performed from just above the seafloor to the full hole depth of 389.0 m wireline log depth below seafloor (WSF). The hole was logged up with the triple combo tool string to 278 m WSF. A second uplog was made from 389.0 to ~139 m WSF. There was a problem with the caliper on the second pass that caused the arm to stick at ~10 inches (bit size). Eventually, it was powered up and a third pass was made from ~317 m WSF with a better caliper response. The second and third passes were spliced together into a complete log. The tools were pulled from the hole and were at the surface at 0445 h. The FMS-sonic logging tool string was then assembled with the following tools: FMS, Dipole Sonic Imager (DSI), HNGS, EDTC, and LEH-QT. At 0630 h, the tool string was lowered without difficulty through the drill pipe and to ~180 mbsl (just above the seafloor). The logging tools were turned on and the hole was logged down to 300 m WSF. After trying unsuccessfully to make it past an apparent bridge, the hole was logged upward. The calipers for the FMS tool were opened at 287 m WSF, and the hole was logged up to just below the end of pipe. The tool string was lowered back to the bottom of the hole, where infill was present to 292 m WSF. A second pass was made over the total length of the open hole. The tool string was pulled back into the drill pipe and logging continued to the seafloor. The tool string was pulled back to the surface and rigged down by 1030 h on 12 August, successfully completing logging operations. The drill string was pulled from the hole, the thrusters and hydrophones were pulled and secured, and Site U1459 ended at 1254 h on 12 August. The total time spent on Hole U1459C was 92.25 h.
Lithostratigraphic units and their boundaries are defined by changes in lithology (using visual core description and smear slide observations), physical properties, color reflectance (L*, a*, and b*), X-ray diffraction (XRD), X-ray fluorescence (XRF), and petrographic thin section analyses. Site U1459 consists of seven lithostratigraphic units (Table T3; Figures F4, F5). The major lithologic differences between units are in texture, degree of lithification, fossil content, diagenetic changes, and mineralogical components. Unit boundaries are defined based on the first occurrence of a new lithology downhole. All smear slide samples are listed in Table T4, thin section samples are listed in Table T5, XRD samples are listed in Table T6, and XRF samples and bulk elemental concentrations are listed in Table T7. Table T3. Lithostratigraphic unit summary, Site U1459. Download table in .csv format. Figure F4. Lithostratigraphic summary, composite record from Holes U1459B and U1459C. Figure F5. Smear slide summary, Site U1459. Table T4. Smear slide samples, Site U1459. Download table in .csv format. Table T5. Thin section samples, Site U1459. Download table in .csv format. Table T6. XRD analysis of dominant mineral phases, Site U1459. Download table in .csv format. Table T7. XRF bulk elemental concentrations, Site U1459. Download table in .csv format. The lithologic descriptions are based primarily on sediments recovered from Hole U1459B for 0–233.02 m core depth below seafloor (CSF-A) (i.e., to bottom of Hole U1459B), augmented with observations from Holes U1459A and U1459C. Descriptions for lithologic units deeper than 233.02 m CSF-A come exclusively from Hole U1459C. Holes U1459A and U1459B were aligned based on drilling depth and confirmed by the similar lithologies in the two holes. The top of Sample 356-U1459C-2R-1A, 0 cm, was aligned with Sample 356-U1459B-46F-1A, 105 cm, based on the presence of the same rock type at these depths. Although Sample 356-U1459C-2R-1A, 0 cm, must align with a location in Subunit Vb in Hole U1459B between Samples 356-U1459B-44F-3A, 55 cm, and 46F-1A, 105 cm, such correlation was not attempted for this interval because cores from Hole U1459B were disturbed by drilling or were not recovered. Unit I is beige to greenish-gray skeletal packstone to floatstone (Figure F4) that is primarily present in Hole U1459A but also occurs in the uppermost parts of Hole U1459B. This unit is lithified at the top and becomes increasingly less lithified with depth. The bioclastic components comprise a diverse assemblage dominated by small and large benthic foraminifers, planktonic foraminifers, bryozoans, bivalves, and gastropods, with some molds of unidentified macrofossils (Figures F5A, F6). Glauconite is intermittently abundant and is most readily recognized macroscopically by the occurrence of green-colored intervals (Figure F4). Based on the abundance of skeletal material (Figure F6), especially macrofossils, and grain size, this unit is interpreted as a neritic facies. Figure F6. Bioturbated skeletal packstones with planktonic and benthic foraminifers, bryozoans, echinoderms, and mollusks. One smear slide from Unit I in Hole U1459A shows micrite with rare nannofossils (Table T4; Figure F5A). Four thin sections were prepared from well-lithified limestone intervals of Unit I (Table T5). The limestones have similar textures and compositions, consisting mainly of moderately to strongly bioturbated skeletal packstones with abundant planktonic (Globigerina spp. and Orbulina spp.) and benthic (Cibicides spp.) foraminifers, coralline red algae fragments (Lithophyllum? ), bryozoa, echinoderms, and mollusks. Glauconite, phosphatized miliolid foraminifers, and finely disseminated pyrite framboids are common (Figure F6). Skeletal grains show intense bioerosion traces (borings). The primary porosity is low. Pores are coated with thin layers of microcrystalline and fibrous dogtooth cement. Brachiopods and bivalves are present as minor skeletal components. No XRD or XRF analyses were performed for Unit I. Unit II is beige to light greenish-gray mudstone to packstone with intermittent centimeter-scale layers of skeletal grainstone (Figure F4). This texture and the fact that Unit II is mostly unlithified distinguishes Unit II from Unit I. Unit II is present in both Holes U1459A and U1459B and is primarily unlithified with partially lithified sections in the lower half of Unit II in Hole U1459B. Identifiable macrofossils are less abundant in the finer grained sediments, but where present, they include bivalves, gastropods, bryozoans, and scaphopods. Small benthic foraminifers (particularly in the top of Unit II in Hole U1459A) and sponge spicules are abundant in the finer grained intervals (Figure F5). Bioclastic components in the skeletal packstones are dominated by small benthic foraminifers, bivalves, bryozoans, and sponge spicules with lesser amounts of echinoderm and gastropod fragments. Glauconite content is variable throughout Unit II but is relatively low compared to other units described from Site U1459 (Figures F4, F5). The stratigraphic variability of glauconite is recognized macroscopically by slight variations in sediment color (e.g., shades of green). Unit II is interpreted as a hemipelagic facies because of the higher abundance of finer grained material and finer scale bioclasts. 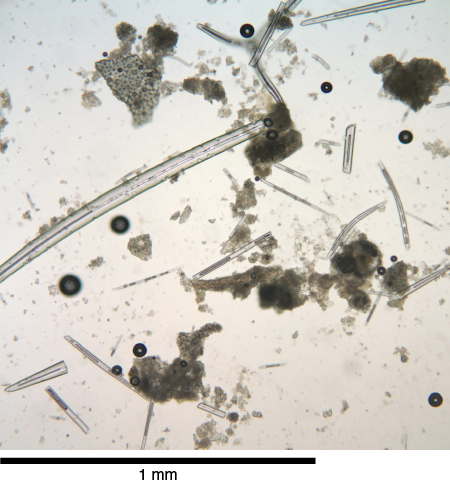 Sponge spicule–rich grainstones dominate smear slide samples near the upper part of Unit II (from Samples 356-U1459B-3F-1, 115 cm, through 4F-2, 60 cm; Figures F5, F7). Deeper than this interval, spicules are rare (Samples 356-U1459B-4F-2, 136 cm, through 5F-3, 36 cm). Smear slides show that the mudstones to packstones in the lower part of the unit are increasingly dominated by foraminifers, mollusk fragments, and bryozoans. Figure F7. Abundant sponge spicules together with foraminifer fragments and other calcitic skeletal grains in a fine micrite matrix. 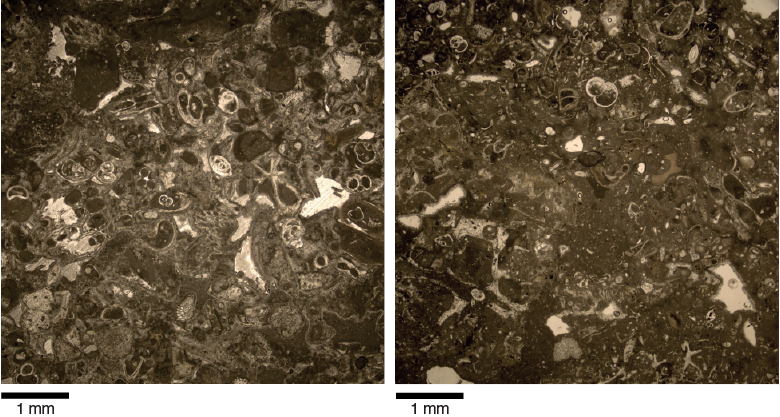 Two thin sections prepared from Unit II are moderately to strongly bioturbated skeletal packstones with abundant planktonic and benthic foraminifers, bryozoans, echinoderm fragments, and mollusks. The foraminifer tests are partly dissolved. Overall porosity is low, and pores are often filled with a thin layer of microcrystalline sparitic calcite cement (Figure F8). Figure F8. Moderately to strongly bioturbated foraminifer-rich skeletal packstone. Mineral composition of two XRD samples from Hole U1459B were analyzed semiquantitatively (Table T6). Low-Mg calcite is the dominant mineral phase, followed by quartz, aragonite, and dolomite. The dolomite is Ca rich with a MgCO3 content of ~42.5 mol%. There were no XRF measurements for this unit. Unit III is defined by a marked increase in glauconite content compared to Unit II and is characterized by packstones to grainstones, alternating between light gray and greenish gray and containing various macrofossils (Figure F4). In both Holes U1459A and U1459B, Unit III is primarily unlithified with some partially lithified intervals near the middle of the unit. Macroscopic and microscopic (see below) analyses indicate bioclastic occurrences are similar in both the gray and green-gray intervals. Bioclasts are dominated by small benthic foraminifers, bivalves, echinoderms, bryozoans, and gastropods, with isolated occurrences of coralline algae, a brachiopod, a solitary coral, and serpulids. Glauconite is discernible macroscopically by color (green), and it occurs as scattered lenses and as glauconite-rich intervals. Particularly dark green (i.e., glauconite rich) intervals with sharp bases and more gradational upper parts are correlated with peaks in natural gamma radiation (NGR) and tend to be more lithified than intervals with less glauconite. The lower part of Unit III (interval 356-U1459A-14F-1, 40 cm, through 14F-CC, 34 cm) is more homogeneous, based on macroscopic analysis (color, composition, and constituents), NGR, and Section Half Multisensor Logger (SHMSL) color reflectance. The Unit III facies is hemipelagic, based on sediment composition, texture, and bioclastic components. 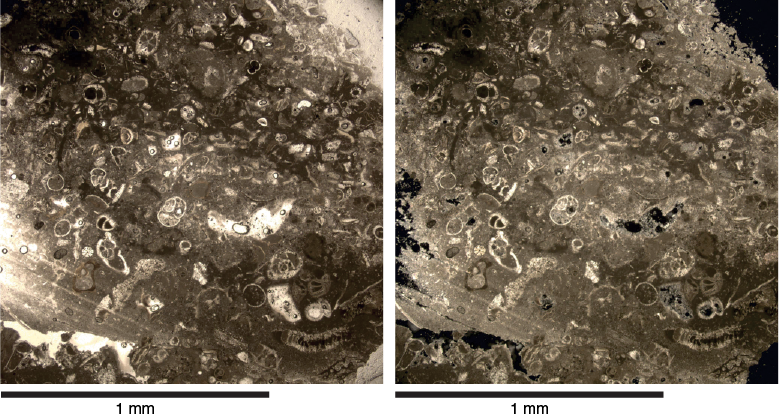 Unit III is rich in sand- and silt-sized foraminifers, with varying amounts of other bioclasts (mainly mollusk and bryozoan fragments, with rare sponge spicules) (Figure F5A). Micrite and loose glauconite grains are present in smear slides throughout the unit, and foraminiferal tests are often glauconitized (Figure F7). Five thin sections were prepared from well-lithified limestones within Unit III. In general, the limestones are foraminifer-rich packstones with abundant mollusks and echinoderm fragments (Figure F9). Silt-sized glauconite and quartz grains are present. Foraminifers are generally medium sand sized and occasionally have geopetal infills. Microsparitic cement is present throughout the unit. Porosity is moderate and mostly moldic. Figure F9. Foraminifer-rich packstones with echinoderms and small amounts of silt-sized glauconite and quartz grains. The mineralogical composition of five samples from Hole U1459A was analyzed semiquantitatively using XRD (Table T6). Low-Mg calcite is the dominant mineral phase, followed by dolomite and then quartz. The dolomite is Ca rich with a calculated MgCO3 content of ~44 mol% based on the d-value of the  peak (Lumsden, 1979). In four samples, aragonite and pyrite are present in trace amounts. Unit IV is an unlithified, cream to light brown packstone and is distinguished from Unit III by a change in texture to packstone and a lower degree of glauconitization (Figure F4). Macrofossils, consisting of bivalves with occasional echinoderm fragments, are rare in this unit and decrease in abundance with depth. Microscopic analyses (see below) indicate the occurrence of planktonic and small benthic foraminifers throughout the unit (Figure F5). Glauconite grains are present throughout Unit IV but are less abundant and smaller than in Unit III. Dolomite appears near the base of Unit IV but is detectable only in microscope analyses; its abundance increases slightly with depth. Sediment composition and characteristics suggest Unit IV is a hemipelagic facies. Planktonic foraminifers, small benthic foraminifers (Figure F10), and other skeletal fragments are present throughout the unit. There is generally less glauconitization than in Unit III, although heavily glauconitized foraminiferal tests and glauconite grains are common. Micrite is present, and isolated crystals of euhedral silt-sized dolomite occur in some samples, particularly in the lower half of the unit. Euhedral dolomite crystals dominate the silt-sized sediment fraction in one sample (356-U1459B-27F-2, 71 cm). Figure F10. 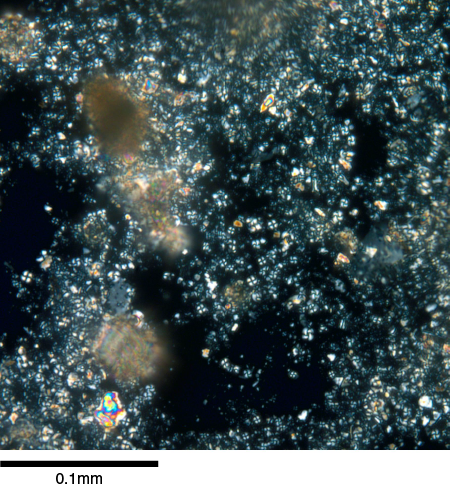 Sand-sized planktonic and benthic foraminifers together with other skeletal carbonates embedded in a fine micritic matrix. Five thin sections prepared from partly and unlithified limestones within Unit IV show mainly skeletal packstones of abundant planktonic and benthic foraminifers, bryozoans, echinoderm fragments, and mollusks (Figure F11). Coarse angular sand-sized intraclasts are present. The intraclasts consist of fine-grained skeletal fragments in a micrite matrix. Figure F11. Unlithified skeletal packstone with planktonic and benthic foraminifers. Four samples from Hole U1459B were analyzed semiquantitatively using XRD (Table T6). Low-Mg calcite is the dominant mineral phase followed by dolomite and quartz. In contrast to Unit III, aragonite is absent. Trace amounts of pyrite are present. The dolomite is Ca rich with a calculated MgCO3 content of ~44 mol%. XRF was measured on spot samples in Unit IV (and Subunit Vb) to test methodologies (Table T7). Too few samples were measured to detect trends or changes between units. Unit V consists of packstone with dolomite divided into two subunits based on variations in degree of lithification, color, concentrations of dolomite, and the quartz and fossil content of the sediment. Fossil content decreases markedly from Subunit Va to Vb. Subunit Va is recovered in Hole U1459B only, and the contact between Subunits Va and Vb is toward the base of Hole U1459B. The top of Hole U1459C begins in Subunit Vb (see Hole alignment for an explanation). Subunit Va is defined by the dominance of euhedral dolomite crystals in smear slide samples (Figure F5). Macroscopically, Subunit Va is primarily an unlithified, light gray to creamy gray packstone (Figure F4). Bioclasts are rare, but when present include bivalves, sponge spicules, and small benthic foraminifers (particularly in the upper half of the subunit) (Figure F5). 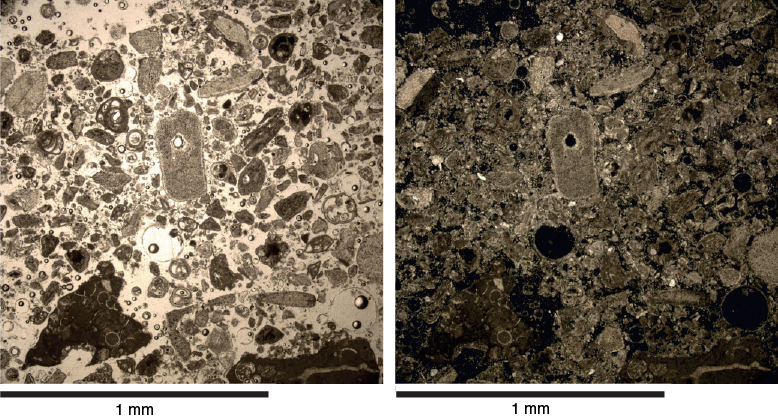 In microscopic analyses, microfossils decline in abundance as dolomite increases in abundance with depth. Glauconite is present throughout much of Subunit Va, although in relatively small amounts compared to other units at Site U1459. There are no bioclasts in the thin sections from the partially lithified to lithified interval (356-U1459B-32F-1, 80 cm, through 35F-3, 0 cm; 151.9–168.2 m CSF-A) (e.g., Figure F12). Sediment composition and rare bioclasts in Subunit Va are indicative of a hemipelagic facies. Figure F12. Nonskeletal packstone with abundant peloids. Smear slides of samples taken from Subunit Va show decreasing amounts of glauconitization compared to Unit IV (Figure F5). Microfossils decline in abundance with increasing depth and are replaced by euhedral dolomite crystals as the dominant component (Figure F13). 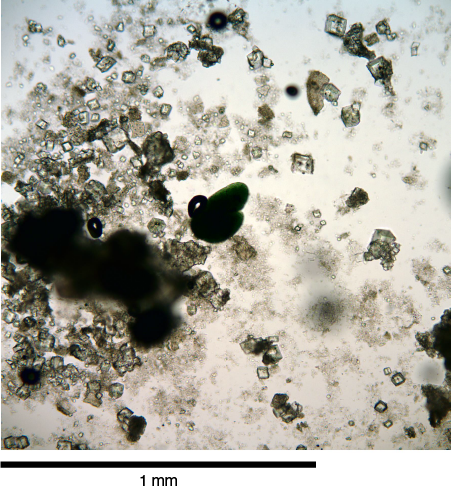 Siliciclastic components also increase, particularly the abundance of sand-sized quartz grains (Figure F5). Figure F13. Abundant silt-sized euhedral dolomite crystals in the lower part of Hole U1459B Subunit Va.
Three thin sections prepared from the lithified limestones within Subunit Va show mainly nonskeletal packstone with abundant peloids and sparitic cement (e.g., Figure F14). Dolomite rhombs suggest early stage dolomitization. Peloidal grains have no signs of compaction. Microspar cement fills pores between the grains. Silt-sized quartz grains are abundant. Echinoderm fragments are the dominant bioclasts, and some are associated with syntaxial cement overgrowth. Figure F14. Quartz sand–rich interval in the lower part of Hole U1459B. The single XRD sample from the lowermost part of Subunit Va is dominated by dolomite, followed by calcite and quartz (Table T6). The relatively high quartz content reflects the increase in siliciclastic material toward the base of this subunit, which continues to increase through Subunit Vb. There were no XRF measurements for Subunit Va.
Subunit Vb is primarily an unlithified packstone, similar to Subunit Va, but is defined as a subunit by macroscale dolomitization and, a couple of meters below the top of the subunit, the presence of quartz sand in smear slide analyses of Hole U1459B (Figure F5B). Subunit Vb is generally unlithified with alternating brown dolomitic grainstone and gray quartz-rich grainstone/sandstone intervals. In Hole U1459C, alternation is similar, changing between cream to brown dolomitic packstone containing very fine grained, well-sorted quartz sand and light grayish-green packstone with some sand and glauconite (Figure F5C). As in Subunit Va, bioclasts are rare but are slightly more diverse, including bivalves, sponge spicules, echinoderms, gastropods, bryozoans, and foraminifers (Figure F5). These bioclastics typically occur in enigmatic skeletal quartz grainstones that contain hematite-coated grains and are interbedded with quartz-rich grainstones. Glauconite is slightly more abundant in Subunit Vb in Hole U1459C than in Hole U1459B. Based on compositional changes/alternations throughout, Subunit Vb facies are hemipelagic. In Hole U1459B, Subunit Vb shows increasing quartz content with depth (Figure F14). Larger aggregates of euhedral dolomite crystals in the lowest intervals indicate increased dolomitization. This is consistent with the increasing lithification of the sediment with depth. 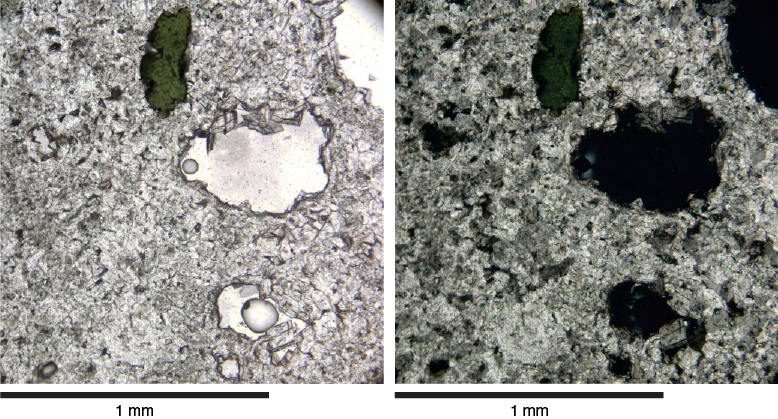 Two thin sections of lithified layers from Subunit Vb show partly silicified, medium sand-sized calcilithites (sandstone with carbonate rock fragments [Figure F15]). Chalcedony and microcrystalline silica cement fill the pores between carbonate bioclasts and partly replace a relatively older carbonate cement generation. Rare bioclast fragments are present. Figure F15. Medium sand-sized calcilithite, with silica cemented throughout. The mineralogical composition of the five samples of Subunit Vb is variable, but dolomite is always an important component, except for Sample 356-U1459B-50X-CC, 6 cm, which is dominated by quartz and low-Mg calcite (Table T6). In four samples, quartz content is higher than calcite content. Trace amounts of pyrite are present in all samples. The dolomite is Ca rich with a calculated MgCO3 content of ~45 mol%. Four XRF spot samples were measured in Subunit Vb (and Unit IV) to test methodologies (Table T7). Too few samples were measured to detect trends or changes between units. Unit VI is a lithified dolostone that darkens downcore from beige to light brown to brown and then lightens again near the base of the unit becoming light greenish gray to cream (Figure F4). Unit VI is primarily differentiated from Subunit Vb by a sharp decrease in siliciclastic (quartz sand) content (see Site U1459 smear slides in Core descriptions) (Figure F5). Glauconite is present throughout the unit. Texturally, the dolostone in Unit VI is relatively homogeneous with a few isolated occurrences of parallel laminations (Figure F4). The sediment composition and scarcity of bioclasts in Unit VI suggest a hemipelagic facies. Smear slides show that euhedral fine to medium crystalline dolomite, ranging from 50 to 250 µm, with varying abundances of detrital glauconite, dominate the sediment of Unit VI (Figure F5). No microfossils are present in this unit. Quartz is only present in minor amounts and decreases further with depth, with quartz absent deeper than Sample 356-U1459C-15R-1, 57 cm (Figures F16, F17). Figure F16. Typical mineralogical composition of Unit VI. Figure F17. Absence of quartz or other lithic grains within sediment in this interval. 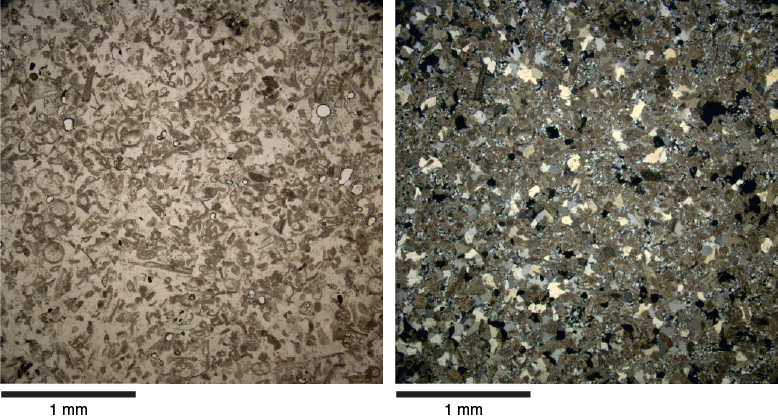 Three thin sections were prepared from lithified intervals within Unit VI, showing highly porous fine to medium crystalline dolostone with medium sand-sized glauconite grains (Figure F18). The size and shape of dolomite crystals varies from fine crystalline anhedral to medium crystalline euhedral. No biogenic components were observed. Porosity (estimated at 10%–15%) is secondary and intercrystalline. Figure F18. Highly porous fine to medium crystalline dolostone with glauconite. Two samples from Hole U1459C were analyzed semiquantitatively using XRD (Table T6). Dolomite is the dominant mineral phase followed by low-Mg calcite. Quartz is present in one sample. The dolomite is Ca rich with a calculated MgCO3 content of ~45.5 mol%. There were no XRF measurements for Unit VI. Unit VII is primarily lithified, nonskeletal, light greenish-gray, chert-rich packstone and microcrystalline, dark gray chert (Figure F4). The first occurrence of chert defines Unit VII. No bioclasts are present, but glauconite, flaser and lenticular bedding, and wavy laminations are common throughout most of the unit (Figure F5). The cherts contain bands of veins and cavities filled by either white carbonate or light greenish-gray grainstone containing glauconite. The Unit VII facies is hemipelagic, based on sediment composition and texture. The lithologic change marking the beginning of Unit VII is confirmed by the reappearance of microfossils in smear slide Sample 356-U1459C-20R-1, 34 cm. The slide shows a diverse assemblage of heavily glauconitized foraminifers, together with echinoid spines, minor amounts of sponge spicules, and mollusk fragments, which are entirely overgrown by dolomite in the upper part of the unit and calcite in the lower part (Figure F5). Dolomite concentrations decrease between Cores 20R and 29R (Sample 29R-1, 50 cm). From this point downcore rare isolated euhedral dolomite crystals occur in the sediment. Detrital glauconite is relatively rare but present throughout Unit VII. Micrite content is higher on average in this unit compared to Unit VI. Quartz content increases with depth. Deeper than Core 30R-CC, quartz remains a minor component with fairly consistent abundances until the end of Hole U1459C. The skeletal packstones of this unit contain abundant and diverse skeletal fragments, which include, in the larger grain sizes, echinoid spines and mollusks with slightly lower amounts of planktonic and benthic foraminifers and minor amounts of sponge spicules and bryozoan fragments. Echinoderm fragment–rich sediments are found primarily between Cores 36R and 37R. 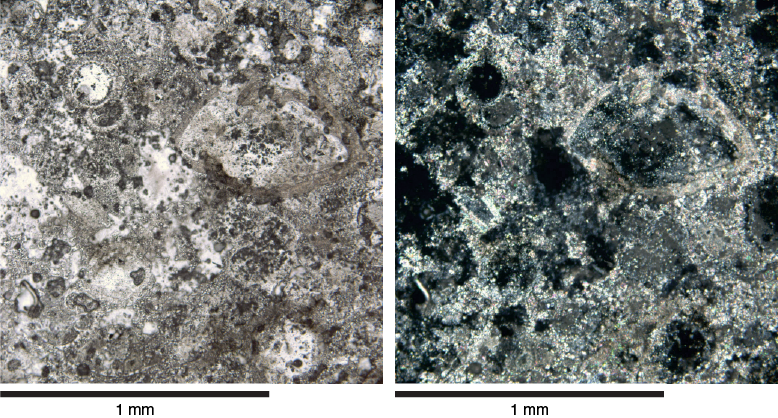 The clay and fine silt (<20 µm) fractions contain calcareous nannofossils throughout Unit VII, where they are a minor to major component of the sediment (Figures F19, F20). 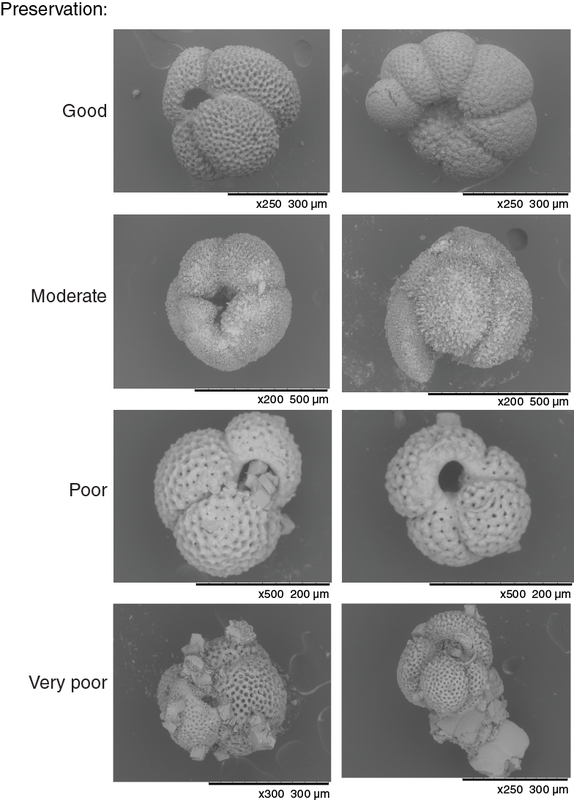 Foraminiferal tests show heavy glauconitization throughout the unit, comparable to the material observed in Units II–IV. Figure F19. 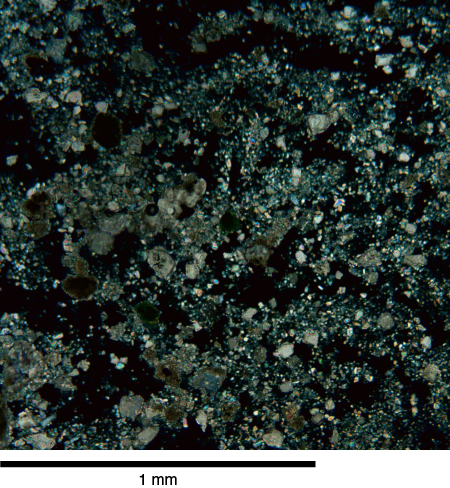 Nannofossil-rich clay layer showing generally fine, clay- to fine silt–sized clay and micrite grains between abundant nannofossils. Figure F20. 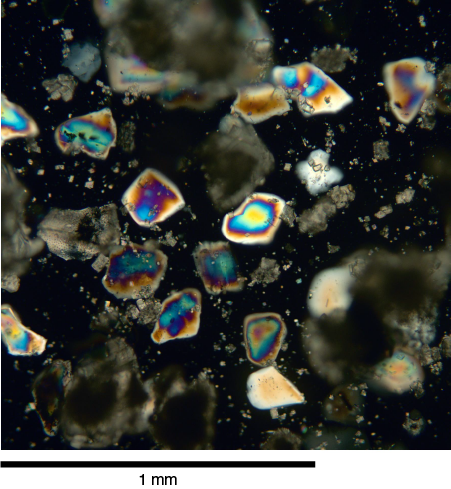 Abundant nannofossils with their distinctive extinction pattern. 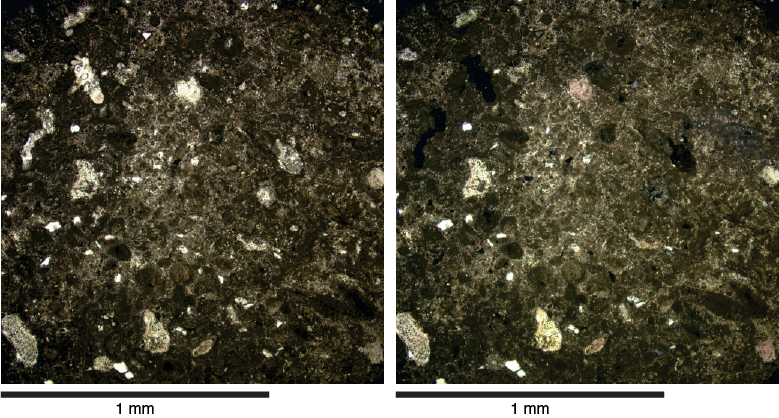 Two thin sections of lithified intervals from Unit VII show partly silicified dolomitic pack- to grainstones (e.g., Figure F21). The primary skeletal limestone has been altered by two phases of diagenesis and replacement. In the early phase of diagenesis the sediment was affected by dolomitization, which resulted in the growth of fine crystalline dolomites throughout the sediment. Subsequently in the late diagenetic phase, chertification affected the texture and components of the rock. Part (probably the larger part) of the primary carbonate rock remains unaffected by diagenesis. Fine-grained chert (chalcedony) partially replaces the finer grains of the primary dolomitized carbonate rock. Figure F21. Chertified dolomitic skeletal limestone. No XRD or XRF measurements were made in this unit. Calcareous nannofossils were rare to abundant at Site U1459 and showed moderate to very good preservation. Holes U1459A and U1459B contain Pleistocene to late Miocene sediments, whereas the strata in Hole U1459C were determined to be early Miocene to early middle Eocene age. A total of 84 smear slides were examined for biostratigraphic marker species and common taxa. Biozone Pt1a (0.61–1.93 Ma) can be identified between Cores 356-U1459A-5F and 10F. 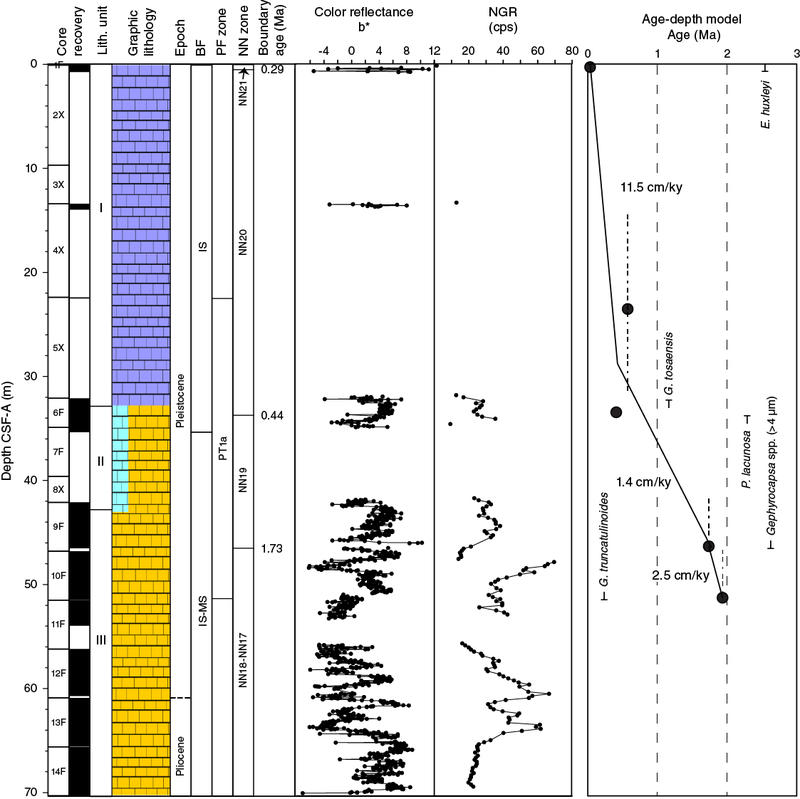 Deeper (Core 356-U1459B-16F), a Pliocene faunal assemblage was found (Biozone PL4) that dates to an age of at least 3.47 Ma (Dentoglobigerina altispira). Between Core 356-U1459B-16F and about Core 356-U1459C-20R, severe dolomitization impeded preservation and made faunal identification difficult. Around Core 356-U1459C-20R, preservation improved with the reappearance of foraminifers, but overall preservation remained (very) poor. The first reappearing species were Oligocene taxa. Deeper than Core 356-U1459C-29R, a distinct Eocene faunal assemblage was present covering Biozones E14–E9 (~38–50 Ma) (i.e., the bottom of Hole U1459C), dating to the latest early Eocene. The samples contained between 15% and 96% benthic foraminifers, and Cibicides spp., and Cibicidoides spp. were the most common taxa. Four assemblages defined by abundances of Textularia spp., Uvigerina spp., Bolivina spp., and epifaunal species were present. In each sample, 1–41 species were present. Except for the top three samples, preservation was poor and affected by diagenesis including dolomitization. The estimated paleobathymetry ranged from shallow/neritic environments to ~500 m.
Core recovery in Hole U1459A was low from 0 to ~42 m CSF-A (top of Core 356-U1459A-9F), with consolidated sediments in the core catchers. Fragments of these sediments yielded rare and moderately preserved nannofossils after sonification in distilled water. The presence of Emiliania huxleyi indicates a recent to Late Pleistocene age for the base of Core 1F (Biozone NN21), and >0.29 Ma for the base of Core 2X (Biozone NN20). The tops of Pseudoemiliania lacunosa and nannofossil Biozone NN19 (0.44 Ma) are between Samples 5X-CC and 6F-2, 100 cm. Gephyrocapsa spp. >4 µm in size (few) were encountered to Sample 9F-CC (46.48 m CSF-A), adding an additional age datum of 1.73 Ma between this core and the next (Sample 10F-CC; 51.44 m CSF-A). Good core recovery and the overall good nannofossil preservation in Hole U1459B resulted in several age datums from Core 356-U1459B-3F (27.05 m CSF-A) downhole (Table T8). The tops of P. lacunosa and Biozone NN19 (0.44 Ma) are between Samples 4F-CC and 5F-CC (31.6 and 34.85 m CSF-A). The abundance of Discoaster spp. was very low (Table T9), which may have prevented the identification of the Pleistocene Biozone NN18 (top of Discoaster brouweri, 1.93 Ma). However, the base of medium (>4 µm) gephyrocapsids is deeper than Sample 9F-CC (53.36 m CSF-A; 1.73 Ma, within Biozone NN19). 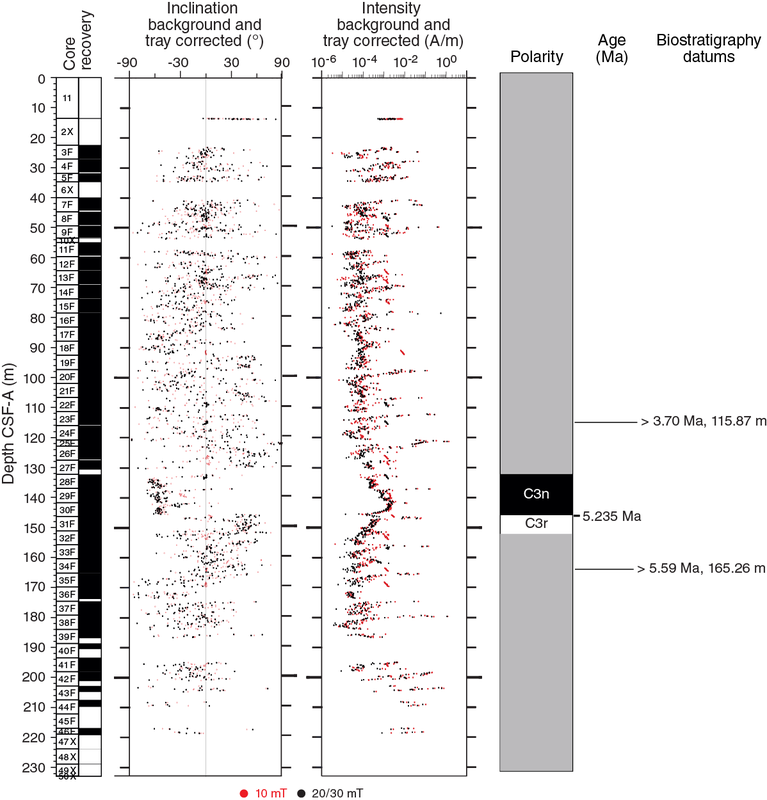 The top of Biozone NN16, which includes the Pliocene/Pleistocene boundary, was marked by the presence of Discoaster surculus in Sample 12F-CC (64.25 m CSF-A; >2.49 Ma). Sphenolithus spp. (mainly Sphenolithus abies) were present from Sample 18F-CC (92.56 m CSF-A) and further downcore, denoting the basal part of Biozone NN16. The top of Biozone NN15 was placed between Samples 22F-CC and 23F-CC (111.6 and 115.9 m CSF-A) based on the top occurrence of Reticulofenestra pseudoumbilicus (3.7 Ma). Species that define early Pliocene Biozones NN14–NN12 (e.g., Amaurolithus spp. and Ceratolithus spp.) were absent. 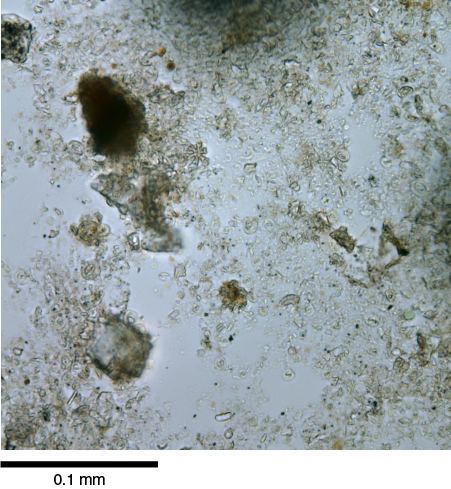 The top of the late Miocene Biozone NN11 (5.59 Ma) was identified by the presence of Discoaster neohamatus in Sample 33F-CC (160.6 m CSF-A) and Discoaster quinqueramus in Sample 34F-CC (165.3 m CSF-A). A barren interval was found in Cores 46F (218.9 m CSF-A) and 47F (219.2 m CSF-A), below which the final sample (48X-CC; 223.9 m CSF-A) investigated for this hole yielded a middle Miocene age. Table T8. Calcareous nannofossil and planktonic foraminifer datums, Site U1459. Download table in .csv format. Table T9. Calcareous nannofossil abundance and range chart, Site U1459. Download table in .csv format. The Pleistocene and Pliocene assemblages in Holes U1459A and U1459B contain abundant small Gephyrocapsa spp. (2 µm) and Gephyrocapsa caribbeanica (3–4 µm) with a varying diversity of other reticulofenestrid species (Table T9). Other taxa that are present include Braarudosphaera bigelowii, Calcidiscus spp., Coccolithus pelagicus, Helicosphaera carteri, Pontosphaera spp., Rhabdosphaera spp., Syracosphaera spp., and Umbilicosphaera sibogae (Table T9; Figure F22). Figure F22. 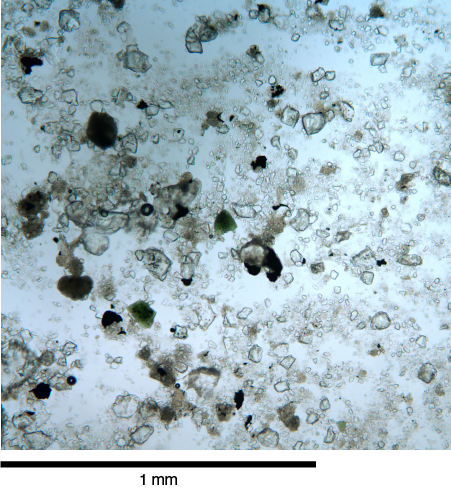 Photomicrographs of calcareous nannofossils, Site U1459. The core catchers in Hole U1459C contained well-preserved calcareous nannofossils that were rare to abundant within a matrix of micrite with variable amounts of micrometer-scale rhombic dolomite crystals. The few barren intervals (Samples 356-U1459C-12R-CC through 14R-CC [253.9–265.3 m CSF-A] and 16R-CC [273.8 m CSF-A]) were dolomite rich. 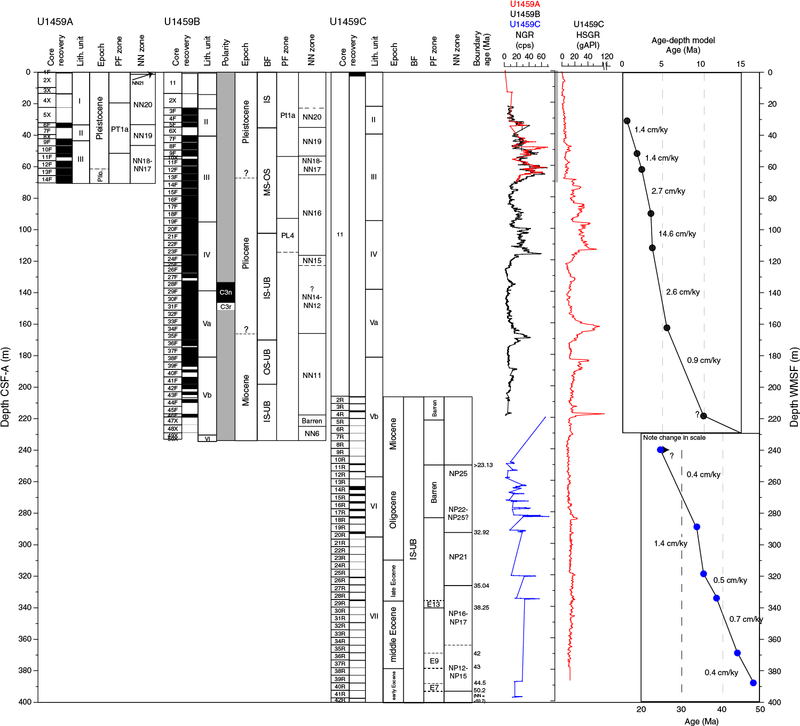 Samples 2R-CC through 10R-CC (206.4–243.9 m CSF-A) contain typical assemblages of early to late Miocene medium- to large-sized reticulofenestrids (including Reticulofenestra haqii and R. pseudoumbilicus). However, no biostratigraphic markers were observed. 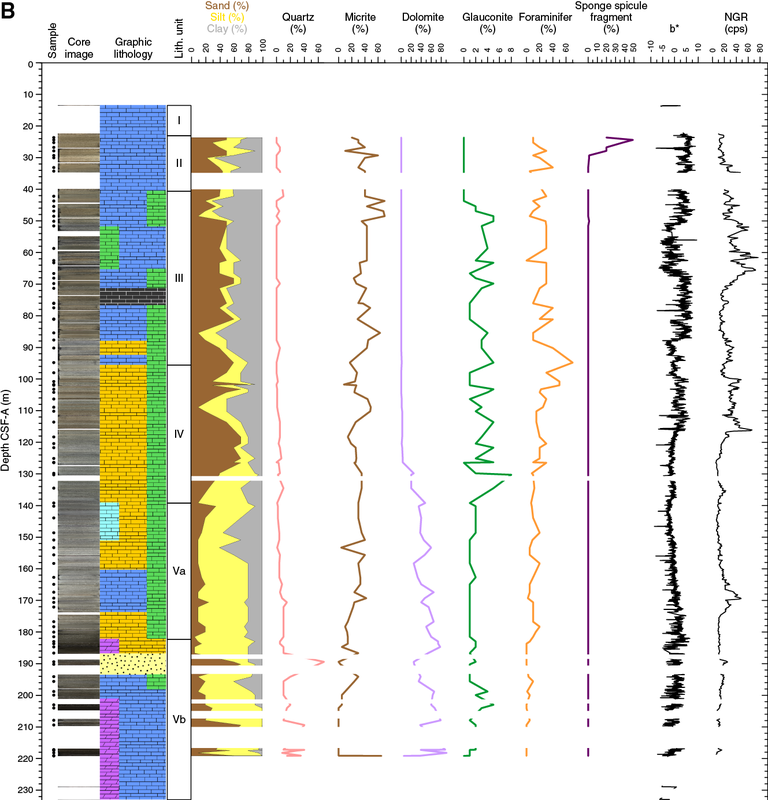 Deeper, core catchers were barren of nannofossils or contained very rare R. haqii only. An earliest Oligocene (or older) age (>32.92 Ma) was inferred based on the presence of Ericsonia formosa in Sample 19R-CC (287.1 m CSF-A) and Reticulofenestra umbilicus (>14 µm) in Sample 20R-CC (293.1 m CSF-A). The presence of Cribrocentrum reticulatum in Sample 26R-CC (321.2 m CSF-A) confirms a late Eocene age (>35.40–41.66 Ma [Gradstein et al., 2012] or >35.24–42.37 Ma in Agnini et al. ), and the base of Hole U1459C was dated to the early middle Eocene based on the presence of Chiasmolithus grandis (Biozones NP11–NP17 [Perch-Nielsen, 1985] or CP10–CP12 according to NannoWare Database v. 1.0), E. formosa (early Eocene, Ypresian; Biozone NP12, <53.7 Ma), and the absence of R. umbilicus (>43.32 Ma) (Figure F22). A total of 14 core catcher samples were processed for Hole U1459A, 47 for Hole U1459B, and 42 for Hole U1459C. 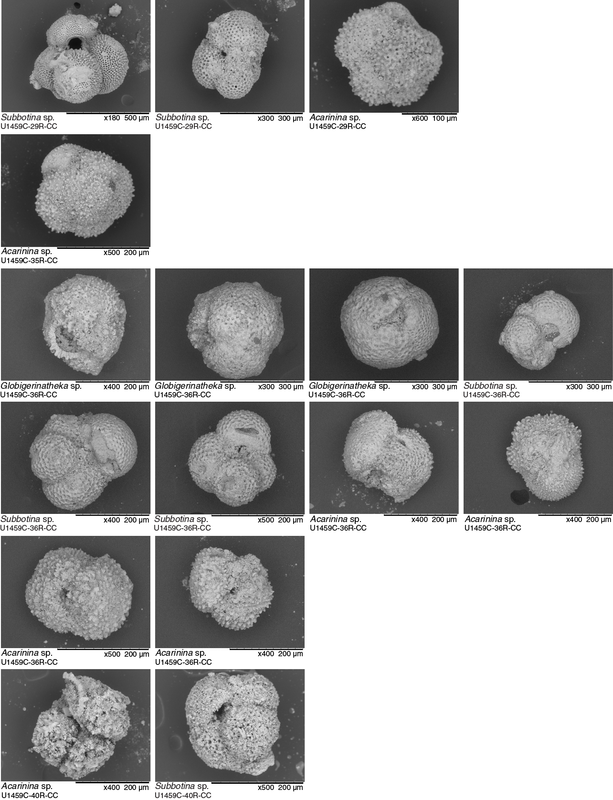 Core catcher samples were analyzed for their planktonic foraminiferal content from Cores 356-U1459A-1F through 11F (0–70 m CSF-A), 356-U1459B-16F through 46F (70–218 m CSF-A), and 356-U1459C-6R through 40R (224.45–387.68 m CSF-A). The overall species diversity was higher than at Site U1458, with 11–15 different taxa; however, diversity decreased in the dolomitized section (>140 m CSF-A) (see details in Lithostratigraphy). Globorotalia tosaensis was identified in Samples 356-U1459A-5X-CC (22.4 m CSF-A) and 6X-CC (34.9 m CSF-A) with a reported top of ~0.61 Ma (Biozone Pt1a) (Table T8). Globorotalia truncatulinoides is present down to Sample 10X-CC (51.4 m CSF-A), indicating an age of <1.93 Ma (base of Biozone Pt1a). Additionally, the indicator species D. altispira first occurs downhole in Sample 356-U1459B-18F-CC (92.5 m CSF-A) and occurs to Sample 26F-CC (127.3 m CSF-A), suggesting an age of >3.47 Ma for this interval (Biozone PL4; Shackleton et al., 1995). From Cores 356-U1459B-18F (last occurrence of D. altispira) through 29F (92.5–141.7 m CSF-A), the fauna includes more typical Pliocene (and early Pleistocene) species such as Globigerinoides extremus, Globigerinoides obliquus, Globorotalia limbata, Neogloboquadrina humerosa, and Globorotalia exilis (Tables T10, T11). G. exilis, however, has been reported as endemic to the tropical Atlantic with Indian/Pacific forms considered morphoforms of Globorotalia menardii (Chaisson, 2003). Table T10. Main genera and species of benthic and planktonic foraminifers and additional bioclasts and minerals, Site U1459. Download table in .csv format. Table T11. 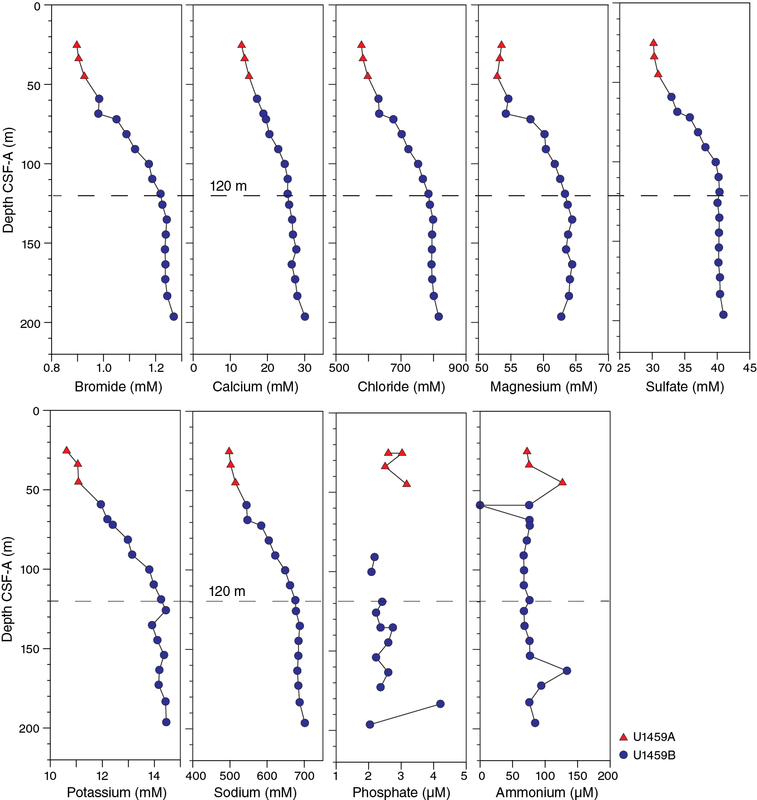 Planktonic foraminifer presence, abundance, and preservation at Site U1459. Download table in .csv format. Deeper than Core 356-U1459B-26F (136.9 m CSF-A), the samples were increasingly affected by dolomite crystallization (see Lithostratigraphy). In Cores 40F through 46F (190.5–218.8 m CSF-A), only few unidentifiable planktonic foraminifers were present (Figures F23, F24). Figure F23. Planktonic foraminifer abundance, Site U1459. Figure F24. Preservation of planktonic foraminifers, Site U1459. From Samples 356-U1459C-6R-CC through 10R-CC (224–243 m CSF-A), planktonic foraminifers were rare. From Samples 11R-CC through 17R-CC (249–278 m CSF-A), foraminifers were absent except for Samples 18R-CC (283 m CSF-A) and 19R-CC (287 m CSF-A), with rare planktonic foraminifers along with abundant benthic foraminifers (see details below) (Figures F23, F25). In Sample 22R-CC (301 m CSF-A), Dentoglobigerina sp. and Paragloborotalia sp. occurred (Wade et al., 2007), indicating an Oligocene age. Figure F25. Dominant benthic foraminiferal species and assemblages, Hole U1460A. This figure is available in an oversized format. Downcore from Core 356-U1459C-29R (335 m CSF-A), Eocene planktonic foraminiferal species were present (Figure F26) including Subbotina gortanii, Subbotina eoceana, Globigerinatheka index, and Acarinina primitiva (Pearson et al., 2006). These species date Core 29R (335 m CSF-A) to the end of the middle Eocene (Biozone E13; ~38–40 Ma), Core 36R (368 m CSF-A) as middle Eocene (Biozone E9, <43.5 Ma) (e.g., Globigerinatheka barri, Acarinina collactea, and Globorotaloides quadrocameratus), and Core 40R (387 m CSF-A) to the latest early Eocene (Biozone E7; Acarinina bullbrooki and Acarinina alticonica; ~50.2 Ma) (Pearson et al., 2006) (Table T8). Figure F26. Typical Eocene planktonic foraminifers, including Subbotina sp., Acarinina sp., and Globigerinatheka sp. A total of 11 core catcher samples were investigated from Hole U1459A, 25 from Hole U1459B, and 26 from Hole U1459C. Overall, the number of species present ranged from 1 (Sample 356-U1459B-38F-CC; 184.1 m CSF-A) to 35 (Sample 356-U1459A-1F-CC; 0.1 m CSF-A), with 13 samples being barren due to alteration such as dolomitization (Samples 356-U1459B-40F-CC through 47F-CC [190.58–218.95 m CSF-A] and 356-U1459C-5R-CC through 17R-CC [220.09–278.47 CSF-A]) (see Tables T10, T12). With the exception of the two uppermost samples from Hole U1459A (Samples 356-U1459A-1F-CC [0.1 m CSF-A] and 2X-CC [0.59 m CSF-A]), the preservation of benthic foraminiferal tests was poor to very poor throughout Site U1459. Preservational damage ranged from abrasion and fragmentation (breakage) to cementation (coating in secondary crystals), particularly by dolomite (particularly Samples 356-U1459B-35F-CC [169.92 m CSF-A] through 356-U1459C-17R-CC [278.47 m CSF-A]) (Table T10) (see Lithostratigraphy). Glauconite was present in varying abundances; it infilled tests downcore from Sample 356-U1459B-5X-CC (22.5 m CSF-A) to the lowest sample (356-U1459C-40R-CC; 387.68 m CSF-A). Table T12. Benthic foraminifer abundance, Site U1459. Download table in .csv format. Species of Cibicides spp. and Cibicidoides spp. were present throughout cores from Site U1459, but five specific foraminiferal assemblages (Figure F25) were found downcore across Holes U1459A–U1459C. From Samples 356-U1459A-1F-CC through 6F-CC (0.1–34.99 m CSF-A), the first benthic foraminiferal assemblage contains a range of shallow-water temperate to warm-water species. The assemblage is dominated by taxa including Quinqueloculina lamarckiana, Amphistegina spp., and Cibicidoides spp., with abundant Discorbinella spp., Quinqueloculina spp., Textularia agglutinans, and Textularia spp. The taxa found in this assemblage reflect an inner shelf paleodepth. The next assemblage is present from Samples 356-U1459A-7F-CC (35.36 m CSF-A) through 356-U1459B-18F-CC (92.56 m CSF-A). This assemblage is marked by a dominance of Heterolepa bradyi and Cibicidoides spp. with abundant Bolivina spp., Brizalina spp., and Trifarina spp. This assemblage contains infaunal shallow-water (50–150 m) species typical of middle and outer shelf depths. The third assemblage is present from Samples 356-U1459B-20F-CC through 34F-CC (102.24–165.26 m CSF-A). This section contains between 7 and 20 species per sample and is characterized by a dominance of Uvigerina peregrina and H. bradyi with bolivinids and brizalinids. Additionally, there is evidence of downslope transport with the presence of abundant shallow-water species Planorbulinella larvata and Elphidium spp. The abundance of infaunal species indicates paleowater depths from the outer shelf to upper bathyal area between 150 and 500 m (Moore et al., 1980). The fourth assemblage is present from Samples 356-U1459B-35R-CC (169.92 m CSF-A) through 356-U1459C-39F-CC (186.92 m CSF-A) and is dominated by Bolivina robusta with abundant H. bradyi, Textularia spp., and Melonis spp. This assemblage has a very low diversity with only 1–11 species per sample, poor preservation, and typifies an outer shelf to upper bathyal paleodepth. The fifth assemblage is present from Sample 356-U1459C-41R-CC (198.02 m CSF-A) to the base of Hole U1459C (387.68 m CSF-A) and is composed almost entirely of epifaunal species. The assemblage is dominated by Cibicidoides spp. and other epifaunal species. Preservation was poor throughout with only 2–11 species per sample due to the heavy dolomitization in this lowermost interval. Here, foraminiferal abundance was substantially reduced and the signal less clear, but dominant taxa would suggest a middle shelf to upper bathyal paleodepth with downslope transport (Elphidium spp.). Overall paleodepth estimates range between 46 m (Core 356-U1459A-2F; 0.59 m CSF-A) and >570 m (Core 356-U1459B-25F; 122.9 m CSF-A) (Table T10; Figure F25). However, because of poor preservation within many of the samples, a reliable proportion of benthic versus planktonic foraminifers could not always be estimated. Investigated benthic foraminiferal diversity and percentage for all holes at Site U1459 are illustrated in Figure F27. Figure F27. Benthic foraminifer diversity and benthic percentage of total foraminifers, Site U1459. Other fossil groups present in the core catcher samples included ostracods, bryozoans, worm casings, and pteropods (Table T10). At Site U1459, 63 samples were analyzed for headspace gas content, 20 samples (5 cm whole rounds) for interstitial water (IW) geochemistry measurements, 24 samples for carbonate, and 20 samples for total organic carbon (TOC) and total nitrogen (TN). Because chert and other lithified materials were recovered in Hole U1459C, no geochemical analyses were performed in this hole except for carbonate and headspace gas measurements, which were made when feasible. In general, the site is characterized by high calcium carbonate (mean = 88 wt%) and low TOC (mean = 0.53 wt%). Elevated salinity also characterizes the site, with values >37 deeper than 45 m CSF-A, reaching maximum values of 50 in the interval from 120 to 195 m CSF-A. Overall, many of the geochemical parameters measured exhibit a change in trend or slope at ~68 or ~120 m CSF-A. 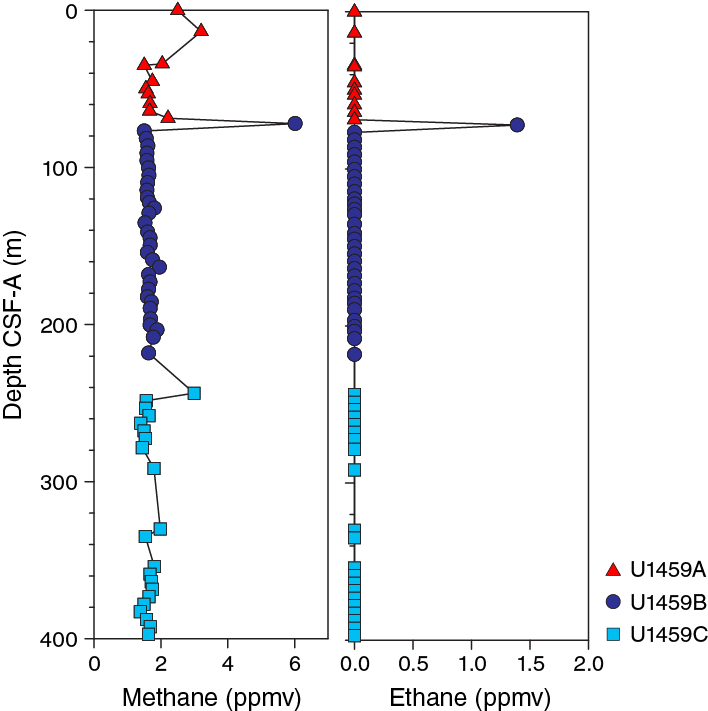 Headspace gas analysis for routine safety monitoring revealed the presence of methane in very low concentrations, with most samples containing <2 parts per million by volume (ppmv) (Figure F28; Table T13). One sample at 72 m CSF-A had slightly higher concentrations of ~6 ppmv; this sample was also the only sample that contained ethane (2.77 ppmv). No higher molecular weight hydrocarbons were detected. Figure F28. Hydrocarbons in headspace gases, Site U1459. Table T13. Headspace gas contents, Site U1459. Download table in .csv format. Salinity at Site U1459 is 36 near the surface and gradually increases with depth to approximately 120 m CSF-A, where a value of 50 is reached (Figure F29). From 120 m CSF-A to the bottom of Hole U1459B, salinity values remain constant at 50. The elevated salinity at this site is notable. Alkalinity at the top of the section is 3.02 mM and displays an overall slight decreasing trend to 120 m CSF-A, where a value of 2.38 mM is noted. Subsequently, alkalinity increases with depth, reaching a maximum 4.65 mM at 183 m CSF-A before finally decreasing to 3.52 mM at the bottom of Hole U1459B. The range of pH values at Site U1459 is relatively small, from 7.5 to 7.7 (Figure F29). The highest pH occurs at the top of the hole, and an overall decreasing trend to lower pH values is noted to approximately 154 m CSF-A, which is followed by slightly increasing pH toward the bottom of Hole U1459B. Figure F29. 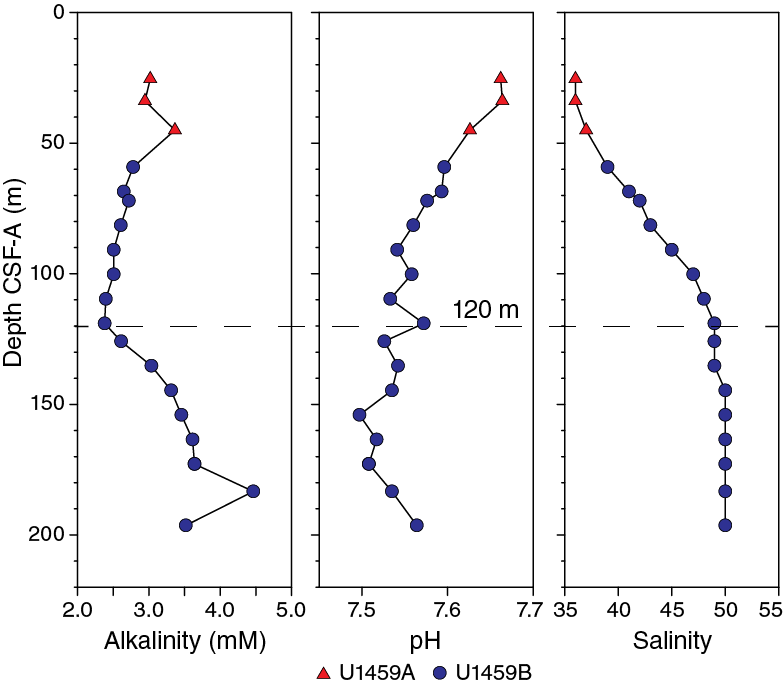 Alkalinity, pH, and salinity, Site U1459. Bromide, calcium, chloride, magnesium, sulfate, potassium, and sodium all display increasing concentrations with increasing depth, with a change in slope noted at approximately 120 m CSF-A in most (Figure F30). Phosphate and ammonium do not follow this pattern; instead, their concentrations are both relatively constant with depth, with mean values of 76.6 and 2.6 µM, respectively (Figure F30). Phosphate concentrations were below the detection limit in several samples. Figure F30. Major element interstitial water geochemistry, Site U1459. Iron and barium were present in IW samples at Site U1459 in low concentrations (Figure F31). In particular, iron concentrations of most samples were not above the detection limit with the exception of two samples collected at 135 and 145 m CSF-A. This is well correlated with the lithostratigraphic Unit IV/Subunit Va boundary, showing association of increasing dolomite content (see Lithostratigraphy). Boron and lithium display similar downcore profiles with relatively rapidly increasing concentrations to approximately 68 m CSF-A, followed by relatively stable or slightly increasing values to the bottom of Hole U1459B. Strontium and silicon display the opposite profile to boron and lithium, with rapidly decreasing values noted in the upper ~68 m CSF-A followed by stable values deeper (Figure F31). Figure F31. Minor element interstitial water geochemistry, Site U1459. 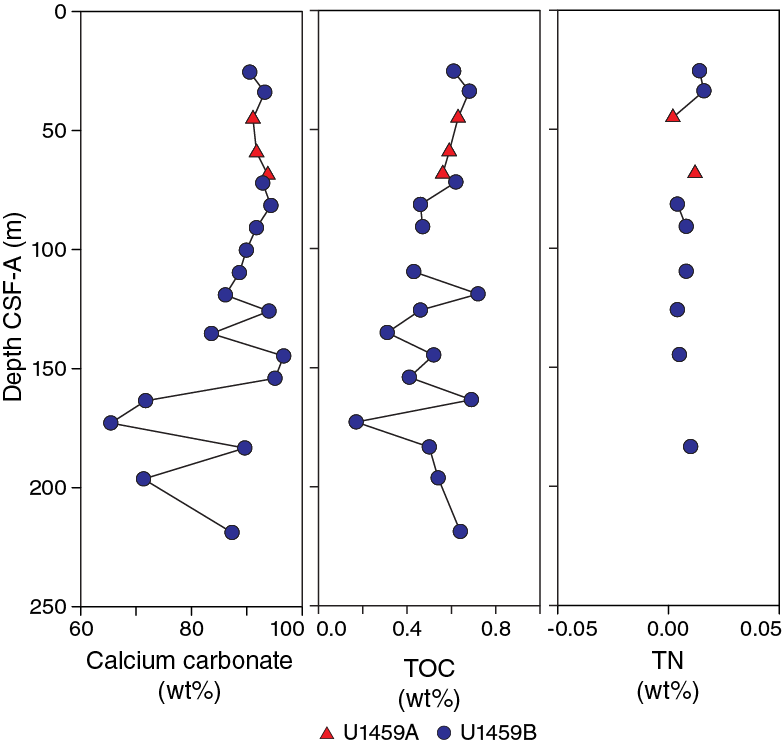 Calcium carbonate content at Site U1459 is high and ranges from 65 to 97 wt% with a mean value of ~90 wt% (Figure F32). Generally, sediments in the interval from 150 to 220 m CSF-A contain lower and more variable calcium carbonate values, which are related to Subunits Va and Vb (see Lithostratigraphy). TOC ranges from 0.17 to 0.72 wt% with a mean of 0.53 wt% (Figure F32); one outlier at 100 m CSF-A was removed because it yielded a negative TOC value. TN is low, ranging from 0.002 to 0.016 wt% with a mean of 0.008 wt%, and was below detection limit in half of the samples analyzed. Figure F32. Bulk sediment geochemistry, Site U1459. Paleomagnetic investigations at Site U1459 included routine measurements and partial demagnetization of natural remanent magnetization (NRM) of archive-half sections and selected discrete samples from working-half sections. 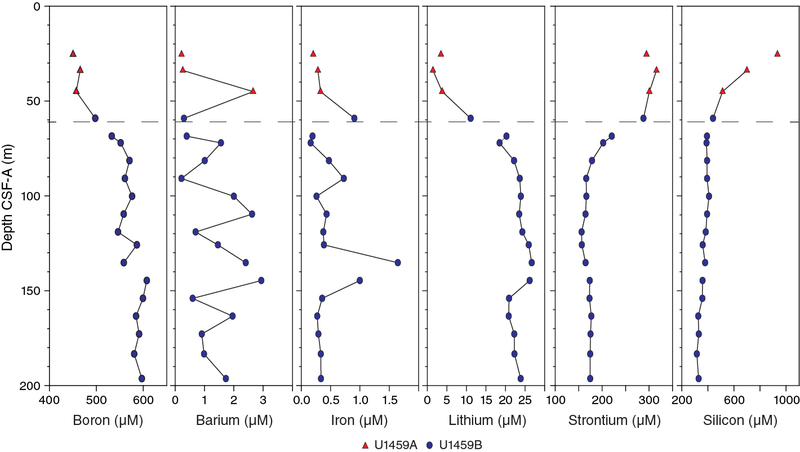 Isothermal remanent magnetization (IRM) acquisition curves were applied for selected samples, and a cumulative log-Gaussian (CLG) curve (Kruiver et al., 2001) was fit with three components for Sample 356-U1459A-2X-CC, which exhibited higher coercivity. Two of the components indicated low magnetic coercivity behavior, indicative of granulometric distribution related to multidomain (MD) magnetite grains. Although it is not possible to correlate Hole U1459B SRM results reliably with the geomagnetic polarity timescale (GPTS), we found evidence for three peaks of negative magnetic inclination (corresponding to normal polarity) and changes in intensity values around 130 and 140 m CSF-A and a peak of positive magnetic inclination (reversed polarity) around 150 m CSF-A. Intensity values of the sediments from 130 to 150 m CSF-A reached 10 −2 A/m after alternating field (AF) demagnetization with peak fields of 20 and 30 mT; however, sediments from the rest of the hole were much weaker (~10 −5 A/m). Based on nannofossil ages at ~110 m CSF-A, the polarity features may be older than 3.7 Ma and may correspond to the three normal polarity intervals from the middle to the top of Chron C3n (C3n.1n, C3n.2n, and C3n.3n) and Subchron C2Ar. However, definitive magnetostratigraphic interpretations cannot be made using this data due to its quality within most of the hole. NRM measurements on archive-half core sections from the uppermost 81.5 m of Hole U1459B were performed with AF demagnetization steps of 10, 20, and 30 mT at 10 cm resolution. Based on the overall stability of the single magnetic component that was observed by means of principal component analysis (PCA) (Figure F33) while accommodating core flow, remaining demagnetization procedures were limited to a peak field of 20 mT. The upper 215 m of Hole U1459B (cored with the HLAPC) was measured (138 sections). Because this section was cored with the HLAPC, the material was unoriented and thus declinations were not used for magnetostratigraphic interpretation. As a result of low core recovery and data quality, it was not possible to construct a dependable magnetostratigraphy for Hole U1459A. Figure F33. AF demagnetization results from archive-half SRM measurements. We collected one to three discrete cube samples (see Paleomagnetism in the Expedition 356 methods chapter [Gallagher et al., 2017]) per core from Cores 356-U1459A-2X through 14F, depending on recovery and core conditions. Of those taken, samples from Cores 2X, 4X, 7F, 10F, and 14F were measured. Stepwise AF demagnetization on these five discrete samples (Figure F34) collected from Hole U1459A was performed at successive peak fields of 0 to 180 mT (steps of 10 mT) using the D-2000 AF demagnetizer (ASC Scientific) to verify the reliability of the split-core measurements and to determine the demagnetization behavior of the recovered sediments. Following each demagnetization step, remanence magnetization was measured with the JR-6A spinner magnetometer and analyzed using Remasoft (version 3.0; Agico, Inc.) software (see Paleomagnetism in the Expedition 356 methods chapter [Gallagher et al., 2017]). Figure F34. AF demagnetization results for discrete samples. One of the samples (356-U1459A-2X-CC, 15–17 cm; 0.62 m CSF-A) exhibited singular behavior with higher coercivity than all other samples. To provide a better constraint on the magnetic coercivity content, which may be present in discrete samples, we generated IRM acquisition curves from representative samples using an IM-10 impulse magnetizer (ASC Scientific). 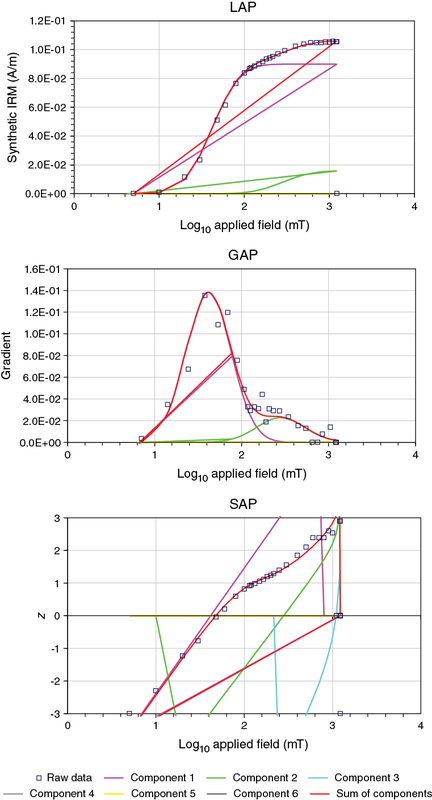 Magnetization was induced in different field steps (0 mT to a field peak of ~1200 mT) along the z-axis of discrete samples, which were previously demagnetized at 180 mT. At each step, induced magnetization was measured using the JR-6A spinner magnetometer. Because the grain-size distributions for minerals in natural magnetic assemblages are logarithmic, the IRM curves for individual magnetic phases add linearly, hence yielding a cumulative curve that can be interpreted by a CLG function (Robertson and France, 1994). A CLG curve was fit with three components by the method proposed by Kruiver et al. (2001) for Sample 356-U1459A-2X-CC, 15–17 cm (Figure F35). Two of the components exhibit low-magnetic coercivity behavior, with saturation IRM (SIRM) between 100 and 200 mT, and reached ~66% of the highest applied field (~1220 mT), which can be indicative of granulometric distribution related to magnetite. Both components showed dispersion parameter values of ~0.3 that, as discussed by Robertson and France (1994), is often characteristic of MD magnetite grains. Unfortunately, the IM-10 impulse magnetizer cannot induce fields much larger than 1.2 T, so it is not possible to unequivocally identify the presence of hematite. As discussed by Peters and Thompson (1998), natural samples of hematite are difficult to magnetize because hematite resists magnetic induction and does not exhibit saturation even at fields around 1 T.
Figure F35. CLG analysis of IRM curve from one discrete sample. 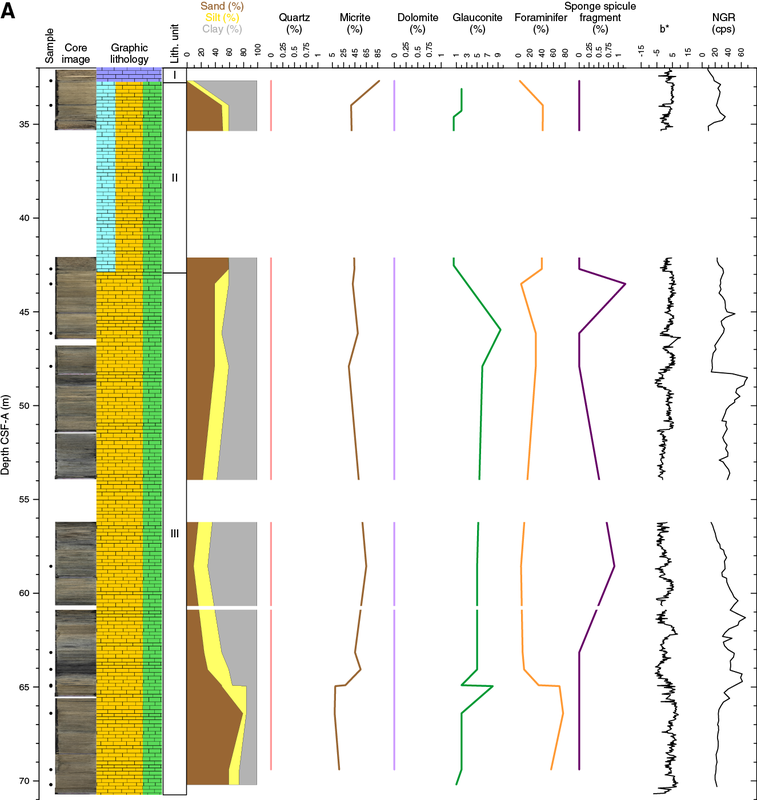 In Hole U1459B, the sediments exhibited residual NRM intensity values ranging from 10 −2 to 10 −5 A/m after AF demagnetization with peak fields of 20 and 30 mT (Figure F36). 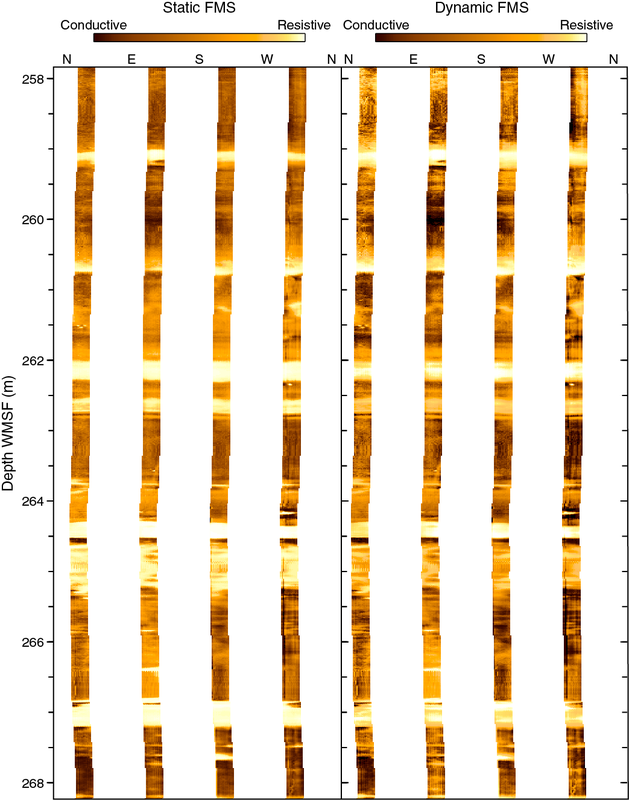 Higher intensity peak values (~1 A/m) were observed throughout the whole succession and can be related to a pervasive drilling-induced magnetization that is commonly encountered (e.g., Gee et al., 1989). Because of the nature of the unlithified sediments and the lack of consistent information from rock magnetism measurements, it is not possible to correlate our results reliably with the GPTS for the last 8 My. However, there are two intervals where magnetostratigraphically significant patterns may be interpreted: (1) three peaks of negative magnetic inclination (corresponding to normal polarity) and changes of intensity values at around 130 and 140 m CSF-A and (2) peaks of positive magnetic inclination (reversed polarity) at around 150 m CSF-A. Based on identification of the top of calcareous nannofossil R. pseudoumbilicus (see Biostratigraphy and micropaleontology) at ~110 m CSF-A, the polarity features may be older than 3.7 Ma and correspond to the three normal polarity intervals from the middle to the top of Chron C3n (C3n.1n, C3n.2n, and C3n.3n) and Subchron C2Ar, although further biostratigraphic data are needed to confirm these interpretations. Figure F36. Magnetostratigraphic data set, Hole U1459B. At Site U1459, physical properties measurements were carried out using the Whole-Round Multisensor Logger (WRMSL), NGR Logger, P-wave velocity caliper, and discrete sampling. Thermal conductivity was measured in several sections and varied between 1.0 and 1.3 W/(m·K). Bulk density was determined using both gamma ray attenuation (GRA) and moisture and density (MAD). These two methods yielded consistent results. The magnetic susceptibility (MS) of the recovered sediments was low, with most readings ranging between −2 and 4 SI. The MS data showed a rising trend from 80 to 140 m CSF-A corresponding to an overall decrease in NGR. NGR also showed several distinct peaks. These peaks proved to be of value for stratigraphic correlation between different holes. P-wave sonic velocities measured at depths shallower than 200 m CSF-A on whole-round cores and discrete samples compare well. In the upper 200 m interval, velocities are typically <2000 m/s. Deeper, P-wave velocities show high values, up to 6257 m/s. These high values were obtained from lithified sediment, including cherts and dolomitic cobbles. Reflectance spectroscopy and colorimetry data display high-amplitude variability, consistent with notable color changes in the sediments. Porosity was generally high, ranging between 50% and 60% to 120 m CSF-A. Further downcore, porosity decreased to a minimum of 35% at 208.5 m CSF-A. Recovery from the uppermost section (0–22.5 m CSF-A) was limited. The recovered material consisted of lithified grainstone to rudstone cobbles. Deeper in Holes U1459A and U1459B, MS, as measured by the WRMSL, shows a decreasing trend from ~22 to 35 m CSF-A in Hole U1459B (Figure F37). After a coring gap of about 7 m in Hole U1459A and about 5 m in Hole U1459B, MS shows some scatter and an overall decrease to the bottom of Hole U1459A and to ~80 m CSF-A in Hole U1459B. In Hole U1459B, this is followed by a rising trend to ~140 m CSF-A. Deeper, two cycles of rapid increase followed by a slow decrease are noted between 140 and 180 m CSF-A. A third such cycle is suggested by data from 180 to 210 m CSF-A in Hole U1459B, but poor recovery makes this lowermost portion of the core difficult to interpret. In the interval between 210 and 400 m CSF-A in Hole U1459C, MS values remain close to 0 SI, with considerable scatter between −4 and +4 SI. However, the recovered material was only within the most lithified portion of the formation(s), so our data are discontinuous and cannot be considered representative of the entire section. Figure F37. Color reflectance ratios, MS, and NGR results, Site U1459. MS was measured a second time on the archive halves (point magnetic susceptibility [MSP]). These measurements were taken at the fast and low precision (one individual measurement) instrument settings, corresponding to measurement times of about 1 s. This setting resulted in poor data resolution that cannot be compared to the WRMSL data. NGR counts obtained from cores showed several distinct peaks that are valuable for correlation between Holes U1459A and U1459B, Hole U1459C downhole logging data, and logs from nearby oil exploration wells. Peaks in NGR occur at 48.5, 61, and 64.5 m CSF-A in Hole U1459A and at 65, 100, and 170 m CSF-A in Hole U1459B (Figure F37). These distinct features are used in cross-correlating Hole U1459A with Hole U1459B (see Stratigraphic correlation). Between 210 and 400 m CSF-A (Hole U1459C), NGR counts were very low. These low counts were also seen in the limited overlapping sediments in Hole U1459B. However, what was recovered in Hole U1459C was only the most lithified portion of the formations, so our data are discontinuous and cannot be considered representative of the formation(s) drilled in Hole U1459C. 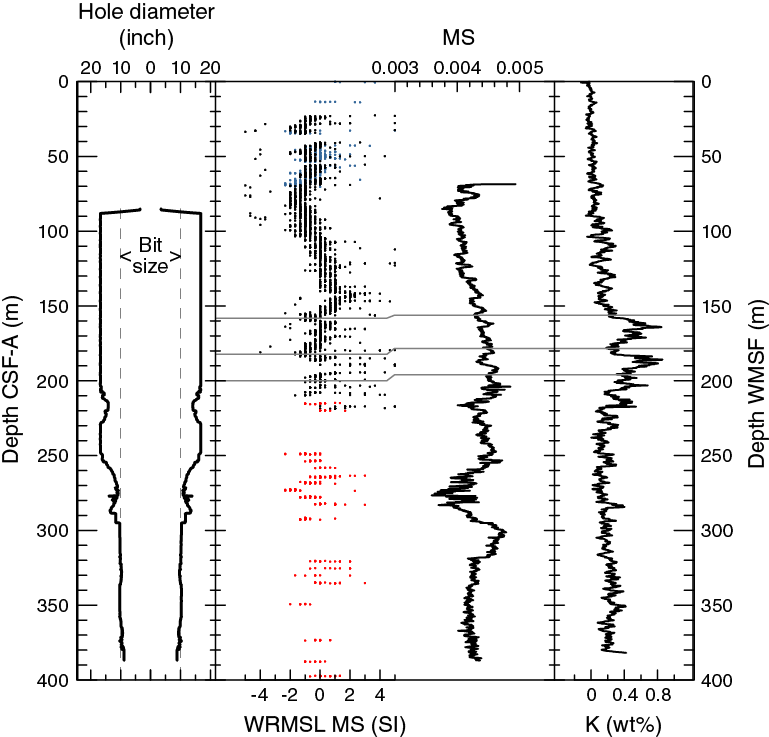 P-wave velocities were measured on Hole U1459A using the WRMSL. Whole-core P-wave data were not reported for Holes U1459B and U1459C because of instrument malfunction and results that were outside the accepted velocity range. Discrete samples were measured on the split cores and a few MAD samples from each hole. The discrete sampling resolution varied between one per core and one every other core; as we advanced ~5 m with each recovered core, this resulted in a resolution of every ~10 m. Comparison with the whole-round data from Hole U1459A showed excellent agreement between discrete and WRMSL results. Thus, despite the lack of WRMSL P-wave data on Holes U1459B and U1459C, we have good data from the discrete measurements. In Hole U1459B, P-wave velocities are mostly <2000 m/s throughout the cores (Figure F38). However, two discrete sample cubes were taken from indurated cobbles at ~60 and ~49 m CSF-A in Holes U1459B and U1459A, respectively. These cemented samples show considerably higher P-wave velocities, in excess of 2000 m/s and as high as 3000 m/s. At the base of Hole U1459B and throughout Hole U1459C, only lithified samples were recovered and measured for their P-wave velocities. The result is a bimodal distribution of P-wave velocities, with lower velocities of 2000–3000 m/s corresponding to lithified dolomite and calcite cobbles. Higher velocities (up to 6257 m/s) correspond to cherts or completely recrystallized dolomite. Figure F38. Bulk density, grain density, porosity, and P-wave velocity, Site U1459. Several experiments were performed on the lithified cube samples from two cores from Holes U1459A and U1459B. A cemented rudstone from Section 356-U1459A-4X-1 and a cemented dolomite from Section 356-U1459B-50X-CC were sampled. Seismic velocity was measured in three directions shortly after sampling and again after sitting in a bath of seawater for 24 h under a vacuum. P-wave velocities of the rudstone increased by 0.2%–2% and decreased by 1%, depending on the axis measured (see Table T14, not shown on Figure F38). P-wave velocities of the dolomite decreased slightly in the x-direction but increased by 1.2%–3% in the other two axes. If the point of soaking the sample in the seawater bath is to replace any lost water, then we would expect an increase in P-wave velocity after soaking for 24 h. However, the velocities generally decrease after soaking but only by a small percentage. These lithified samples show little change in their sonic velocities after drying. The dry velocities decreased in the rudstone by 4.9%–6.5% compared to the soaked wet velocities. An accurate reading of the wet velocities is critical. However, it appears that measurements taken shorty after sampling are at least as accurate as those taken after 24 h immersion under a vacuum. Table T14. P-wave velocity, Site U1459. Download table in .csv format. GRA, measured every 5 cm on the WRMSL, was used to estimate bulk density. GRA increases with depth from 20 to 40 m CSF-A in Hole U1459B (Figure F38). Two cycles of decreasing bulk density with depth are seen between 40 and 56 m CSF-A and between 55 and 70 m CSF-A in Holes U1459A and U1459B, respectively. Beginning at 80 m CSF-A in Hole U1459B, there is a slow increase in density with depth to the base of the hole. However, variability in GRA values increases with depth beginning at ~160 m CSF-A. 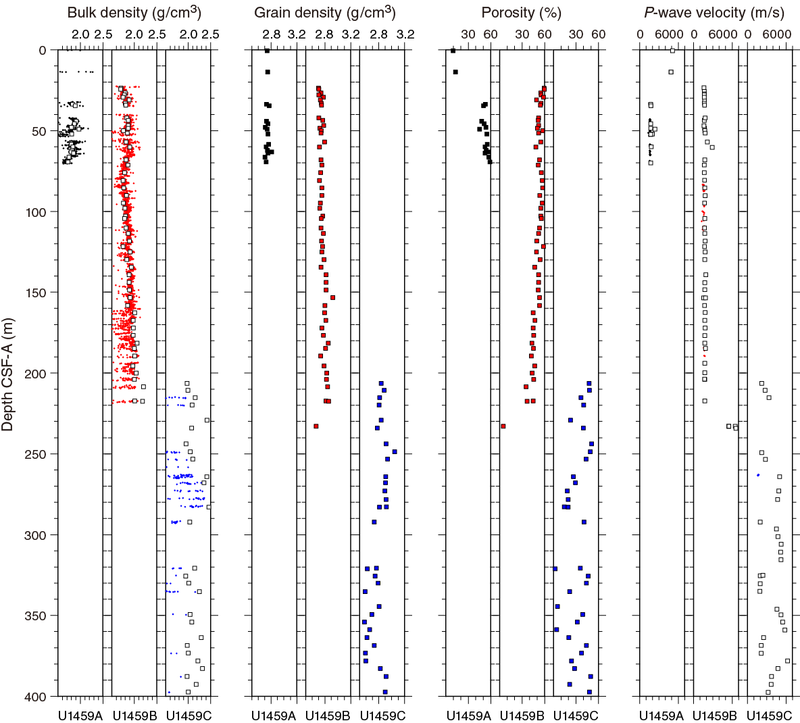 In Hole U1459C, GRA bulk density values are quite variable. Considering that these measurements were done on cobbles within an air-filled core liner, these measurements cannot be interpreted. Discrete samples were obtained from the core at an interval of one or two samples per core. These were generally taken from the middle of the core where evidence of disturbance was low and where smear slides were also taken (see Lithostratigraphy). The discrete bulk density measurements compare very well to the GRA estimates of bulk density in both Holes U1459A and U1459B (Figure F38). Deeper than ~160 m CSF-A in Hole U1459B, where the GRA bulk densities are variable, the discrete results correspond to the higher GRA bulk density estimates. In Hole U1459A, discrete bulk densities show the two cycles of decreasing density between 40 and 70 m CSF-A. However, these two cycles are not seen in Hole U1459B. Discrete measurements of grain densities also show a trend of increasing values with depth beginning at ~80 m CSF-A in Hole U1459B. 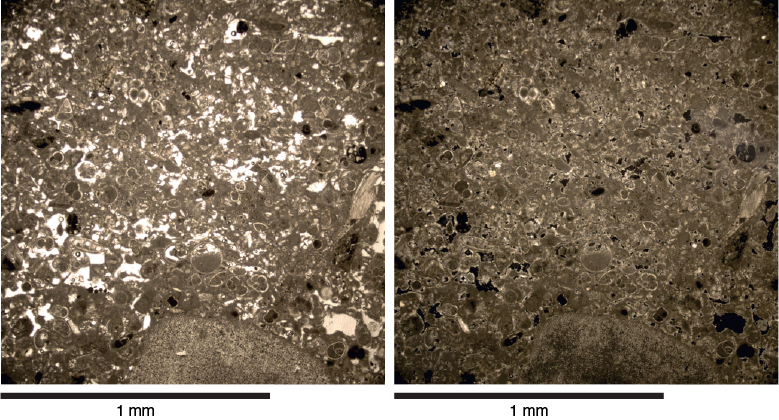 Because of the high carbonate contents of the sediment, this increase in grain density may reflect increasing diagenesis and generation of dolomite from calcite. Throughout the cored interval, porosity values have a wide range between 10% and 60%. Porosity decreases with depth beginning at ~50 m CSF-A in Hole U1459B. Porosity drops to 35% at 208.5 m CSF-A. Shallower than 50 m CSF-A, porosity ranges between 50% and 60%. Exceptions are several lithified rocks (rudstones in Hole U1459A and dolomite in Hole U1459B), which have low porosity (<20%). In Hole U1459C, the lithified cobbles result in variable porosity values that range between 50% and <10%. The very low values correspond to chert samples, whereas the higher values reflect different degrees of cobble cementation. Several experiments were performed on lithified cube samples. A cemented rudstone from Section 356-U1459A-2X-CC and a cemented dolomite from Section 356-U1459B-50X-CC were sampled as cubes. They were weighed shortly after sampling and reweighed after sitting in a bath of seawater for 24 h under a vacuum (Table T15). The rudstone decreased in weight by 0.23% after 24 h, whereas the dolomite increased in weight by 0.14%. Since the cube needed to be patted dry before weighing, we suggest that these small differences may be attributed to different amounts of water adhering to the outside of the cube. In short, we did not find that 24 h of soaking significantly changed the weight of lithified samples. Table T15. Impact on sample weight of soaking lithified cube samples in a seawater bath, Site U1459. Download table in .csv format. 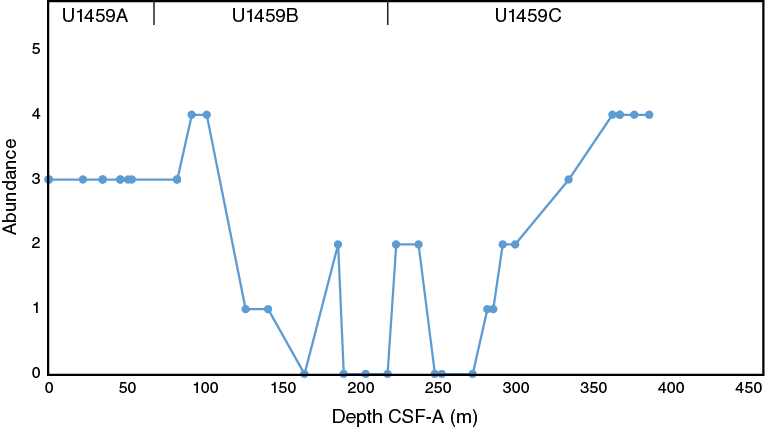 The upper portions of Holes U1459A and U1459B (0–22.5 m CSF-A) display reflectance spectroscopy and colorimetry data that are widely scattered over short stratigraphic intervals (Figure F37). Deeper in Holes U1459A and U1459B, reflectance spectroscopy and colorimetry data show well-developed cyclicity, which proved useful for stratigraphic correlation between holes (see Stratigraphic correlation). Between 34 and 54 m CSF-A in both Holes U1459A and U1459B, decreasing L* and b* values indicate that sediments become gradually darker with depth. Between 50 and 70 m CSF-A, variability in L* and b* is at a maximum because of the alternation of pronounced dark layers and beige layers. These lithologic alternations are similar and occur close to the same depth in both Holes U1459A and U1459B (see Lithostratigraphy). For example, the same dark layer occurs at 64.3 m CSF-A in U1459A and 65.0 m CSF-A in U1459B. In the interval between 70 and 85 m CSF-A in Hole U1459B, the sediment is characterized by high b* and intermediate L* values. At 85 m CSF-A, b* values drop sharply and recover slowly to 115 m CSF-A. This sudden color change is not present in either L* or a*. Between 115 and 125 m CSF-A, b* decreases again, accompanied by a more gradual drop in a*. Deeper, the color indexes are relatively stable until 135 m CSF-A, at which depth all three color indexes show a rising trend to 160 m CSF-A (a* and L*) and 180 m CSF-A (b*). A peak in redness and yellowness (high a* and b*) occurs between 250 and 265 m CSF-A (Hole U1459C). Deeper in the section, these values decrease until 280 m CSF-A, thereafter remaining relatively constant through the deeper portion of Hole U1459C. Thermal conductivity measurements were taken on six whole-round core sections from Hole U1459A and 5 from Hole U1459B. Results were variable and ranged from 1.0 to 1.3 W/(m·K) with means of 1.13 W/(m·K) in Hole U1459A and 1.18 W/(m·K) in Hole U1459B (Figure F39). Thermal conductivity measurements were not taken deeper than 60 m CSF-A in Hole U1459B because readings became unreliable. Thermal conductivity measurements were not assessed in Hole U1459C. Figure F39. Thermal conductivity, penetrometer, and shear strength results, Site U1459. Discrete measurements of shear and normal stress were taken in Hole U1459B from Core 356-U1459B-21F onward. The measurements were taken where the sediments were soft enough to use the handheld Torvane and the pocket penetrometer. No stress measurements were conducted on Hole U1459C cores, as the recovered material from this hole was lithified. The penetrometer data were variable with a wider range between 100 and 150 m CSF-A than between 150 m CSF-A and the bottom of Hole U1459B (deepest measurement at 217.4 m CSF-A). Shear strength measurements are also variable throughout Hole U1459B (Figure F39). A comparison between these two measures of strength yields a correlation coefficient of 0.45, suggesting that there is some relationship between the two. Downhole measurements in Hole U1459C were successful and consisted of runs with the triple combo and FMS-sonic tool strings. Because of safety concerns, the triple combo tool string was deployed downhole with a reduced configuration (without the porosity and density tools). Using the triple combo, we measured borehole width, total spectral gamma ray (HSGR), and MS from the seabed to 390 m wireline log matched depth below seafloor (WMSF) (i.e., 10 m above the bottom of the hole) with the drill pipe at 72.2 m WMSF. Two up and down passes were made with this tool (see Operations). The FMS-sonic tool failed to deploy deeper than 288 m WMSF. No downhole temperature measurements using the advanced piston corer temperature tool (APCT-3) were attempted at Site U1459. The preprocessed logs were sent to the Borehole Research Group at Lamont-Doherty Earth Observatory where the logs were processed on shore before sending the processed logs back to the ship during Expedition 356. The wireline logs were depth matched during this processing. The preprocessed logs were first shifted to the seafloor (−205 m), which was determined by the step in gamma ray values observed on the triple combo main run at 205 m. This differed by 2 m from the seafloor depth of 203 meters below rig floor (mbrf) determined by the drillers. The depth-shifted logs were then depth matched to the HSGR log from the main pass of the triple combo. We consider that there is at least a 2 m discrepancy between core depths (CSF-A) and wireline logging depths (WMSF). In the discussion below, we refer to all logs in WMSF and all cores in CSF-A, realizing that the match between the two is only approximate within several meters. The HSGR logs obtained with a reduced triple combo tool string showed good agreement with the NGR data obtained on whole-round cores from Hole U1459B. Many NGR peaks and troughs observed in Hole U1459B cores were reproduced in the Hole U1459C downhole log (Figure F40), disregarding the uppermost 72.2 m where the HSGR signal is attenuated because of the drill pipe. The five-window spectroscopy of the HSGR tool allows the approximate concentrations of uranium (U), thorium (Th), and potassium (K) to be determined. These data showed that the large peaks in HSGR in the upper 150 m (lithostratigraphic Units III and IV) of Hole U1459C were mainly driven by variations in U content. The HSGR peak in the downhole logging data at 160 m WMSF corresponds to the observed NGR peak in Hole U1459B cores at 168 m CSF-A. This peak was the result of increased concentrations of both U and K, and, to a lesser extent, Th. The HSGR peak in the downhole logging data at 185 m WMSF corresponds to the NGR peak in Hole U1459B cores at 192 m CSF-A, despite the higher amplitude of the peak in the downhole logging HSGR data. This peak was the result of increased concentrations of Th and K and may be consistent with an increase in the input of detrital minerals. These high HSGR values occurred within lithostratigraphic Subunit Vb, which was described as an unlithified dolomitic packstone to grainstone interbedded with lithified fine quartz sand (see Lithostratigraphy). In contrast, the prominent narrow HSGR peak at 217 m WMSF was dominated by U and likely indicates a hardground with condensed sedimentation. However, we could not evaluate the sediments that correspond to this peak, as core recovery in this interval (around Cores 356-U1459B-44F and 45F and Cores 356-U1459C-2R, 3R, and 4R) was low. Figure F40. HSGR, NGR, and elemental U, Th, and K concentrations. 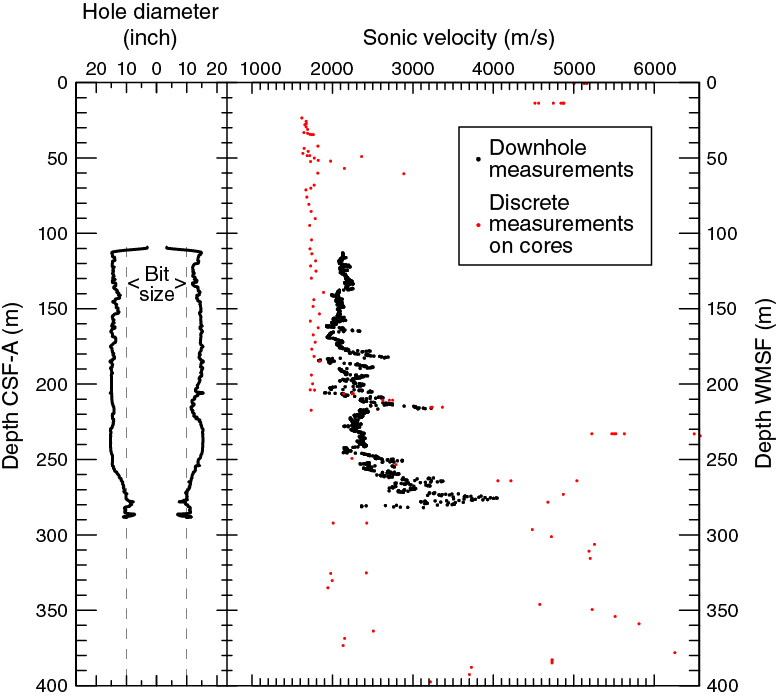 When distinct peaks and troughs in gamma ray values were correlated between the whole-round core NGR data from Hole U1459B and wireline log HSGR data from Hole U1459C (gray lines on Figure F40), the wireline depth was consistently shallower than the cored Hole U1459B CSF-A depth scale. The offset between wireline and coring depth was 2–3 m between 50 and 100 m WMSF, increased slightly to 3–4 m between 100 and 150 m WMSF, and further increased to 7–8 m between 150 and 200 m WMSF. The MS data, as measured during downhole logging with the triple combo, confirmed the increasing trend in susceptibility between 75 and 145 m WMSF, as observed in the data obtained from measuring cores with the WRMSL (Figure F41). However, between 145 and 155 m CSF-A, the MS data from Hole U1459B cores show a rapid decrease that is not present in the downhole logging data. In contrast, downhole MS increases gradually with depth between 145 and 210 m WMSF. In this depth interval, there is good correlation in meter- to decimeter-scale variations in the MS data from Hole U1459B cores and wireline logging K concentration data from Hole U1459C. For example, pronounced minima in core-based MS occurred at 158, 182, and 200 m CSF-A and corresponded to minima in K (in weight percent) at 156, 179, and 195 m WMSF in the downhole data. 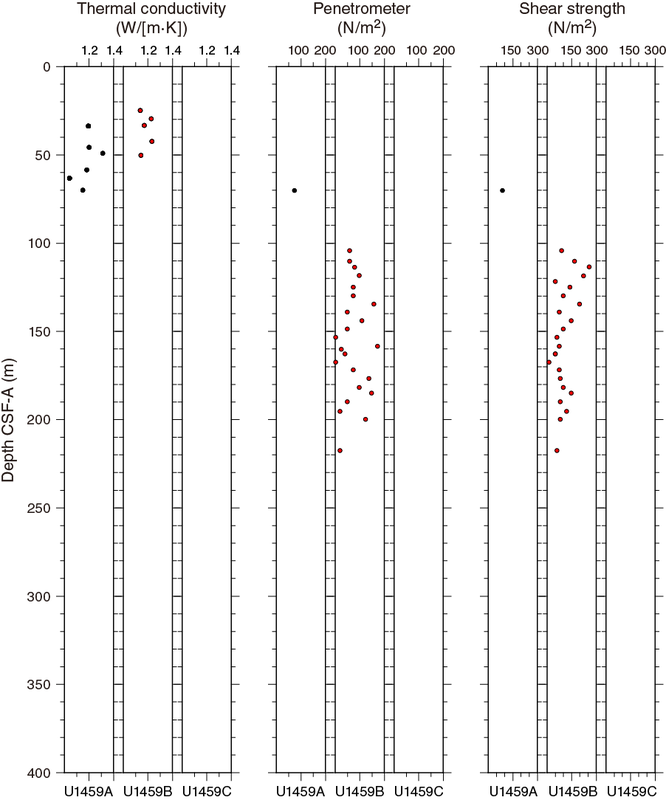 It was unclear why these high-amplitude variations in MS from Hole U1459B cores did not show up in the downhole MS data. In any case, the latter correlations between core-based MS measurements and wireline K estimates are in agreement with the above-reported offset between wireline depth in Hole U1459C and cored depth in Hole U1459B. Between 210 and 275 m WMSF, the downhole logging MS data decrease in two steps. The first step (around 217 m WMSF) corresponds to the prominent thin U peak discussed above (see Figure F40). The pronounced minimum in the wireline logging MS data at 276.5 m WMSF corresponds to a minimum in MS data obtained from Section 356-U1459C-16R-1 at 273 m CSF-A. Downhole logging MS values increase between 275 and 300 m WMSF, decrease between 300 and 317 m WMSF, and remain relatively stable between 317 m WMSF and the lowermost data point obtained by wireline logging at 387 m WMSF. The relatively stable MS of sediments in the lowermost ~80 m of Hole U1459C is in agreement with the limited number of data points obtained from cobbles in cores from this interval. Figure F41. MS measured by triple combo, WRMSL MS, and elemental K estimated from HSGR spectra. FMS images reveal differences in textures and lithology through the logged interval of Hole U1459C from about 112 to 286 m WMSF. The FMS images are generally good deeper than about 250 m WMSF, whereas the shallower images are only of intermediate quality. This was true for both the first and second passes, so we relate the differences in quality to the condition of the borehole rather than to the sea state and high heave during logging operations (see Operations). Within the small interval of good quality images, we find alternations in resistivity (e.g., Figure F42) that may reflect changes in sediment electrical properties related to changes in lithology. The spacing between these alterations ranges from several tens of centimeters to 2 m, with thin (several tens of centimeters) resistive layers embedded within broader, more conductive areas (1–2 m). Often, FMS images are compared against resistivity logs, but no such logs were acquired for this hole. There is no evidence for any dip of the sediment layers, consistent with direct inspection of the cores (see Lithostratigraphy). Figure F42. Representative FMS images, reflecting variations in resistivity through the logged formations, Hole U1459C. Between 100 and 200 m WMSF, sonic velocities measured during downhole wireline logging of Hole U1459C were a few hundred meters per second higher than sonic velocities obtained from discrete measurements with the P-wave caliper from Hole U1459B (Figure F43). Also, between 175 and 210 m WMSF, the wireline sonic velocities are considerably more variable than the discrete measurements. At 216 m WMSF, wireline sonic velocities peaked at 3228 m/s. This observation is in agreement with the discrete P-wave velocity measurements made on a lithified dolomitic cobble from Section 356-U1459C-4R-1 (215.34 m CSF-A). Reported sonic velocities for this cobble were 3366, 3224, and 3239 m/s in the x-, y-, and z-directions, respectively (see Physical properties). These results suggest that the retrieved dolomitic cobbles can be considered representative of the formation. Between 217 and 245 m WMSF, wireline sonic velocities were relatively constant with values between 2150 and 2400 m/s. In this interval, discrete measurements were only possible on lithified cobbles whose sonic velocities exceeded 5000 m/s. Therefore, these cobbles should not be considered representative of the drilled formations. Between 245 and 275 m WMSF, wireline P-wave velocities increase rapidly from 2400 to 4047 m/s and show large variability. Deeper downhole, wireline sonic velocities drop steeply to ~2360 m/s at ~281 m WMSF. Only a handful of discrete P-wave measurements from Hole U1459C are available between 245 and 282 m CSF-A, making a detailed comparison impossible. However, the considerable scatter in these discrete measurements is in agreement with the observed variability of wireline sonic velocities. Figure F43. Hole U1459C diameter and sonic velocities from Hole U1459B discrete measurements and Hole U1459C wireline. Three holes were cored at Site U1459. The highest recovery occurred in Hole U1459B and the sediments ranged from Late Pleistocene to middle Miocene in age. Unfortunately, recovery in Hole U1459A was not sufficient to allow for either detailed analysis or a high-resolution correlation between Holes U1459A and U1459B. Hole U1459C extended into the Eocene. A natural gamma wireline log was run in Hole U1459C, but the very low recovery did not allow for correlation between Hole U1459C lithology and the wireline log. Coring at Site U1459 was complicated by the presence of hard intervals within softer lithologies. Penetration of these sediments required the use of the XCB system (see Operations). This combination of lithologies was a particular problem in the upper 55 m (Hole U1459A) and lower 200 m (Hole U1459C) and resulted in discontinuous recovery with significant gaps in Holes U1459A and U1459C. Hole U1459B recovery was more successful because the depths of the hard intervals were known and the HLAPC cores were strategically planned to increase core recovery. This strategy did increase core recovery, but the intervals cored with the XCB system still had low or no recovery. Although a correlation was made between Holes U1459B and U1459A using color reflectance b* data (Table T16; Figure F44), a detailed, complete composite depth scale could not be generated because of the many intervals of zero to very poor recovery. In addition, if the sediments were not completely indurated, some homogenization may have occurred during recovery and handling in those cores with less than full recovery. Therefore, the records presented may not accurately represent in situ lithology, especially in Hole U1459A and the deeper part of Hole U1459B (>170 m CSF-A). Hole U1459C was drilled down to overlap Hole U1459B at 208.6 m CSF-A. Recovery was also low and the dominant lithology recovered in Hole U1459C was chert. The discontinuous recovery in Hole U1459C hindered correlation of the core to the downhole logs. Table T16. Affine table, Holes U1459A, U1459B, and the top of Hole U1459C. Download table in .csv format. Figure F44. Color reflectance b* correlation between Holes U1459A and U1459B. Integration of physical properties records (b* and NGR) and wireline HSGR data with biostratigraphy and magnetostratigraphy (Figures F45, F46, F47) indicates that the oldest sediments recovered were of Eocene age. 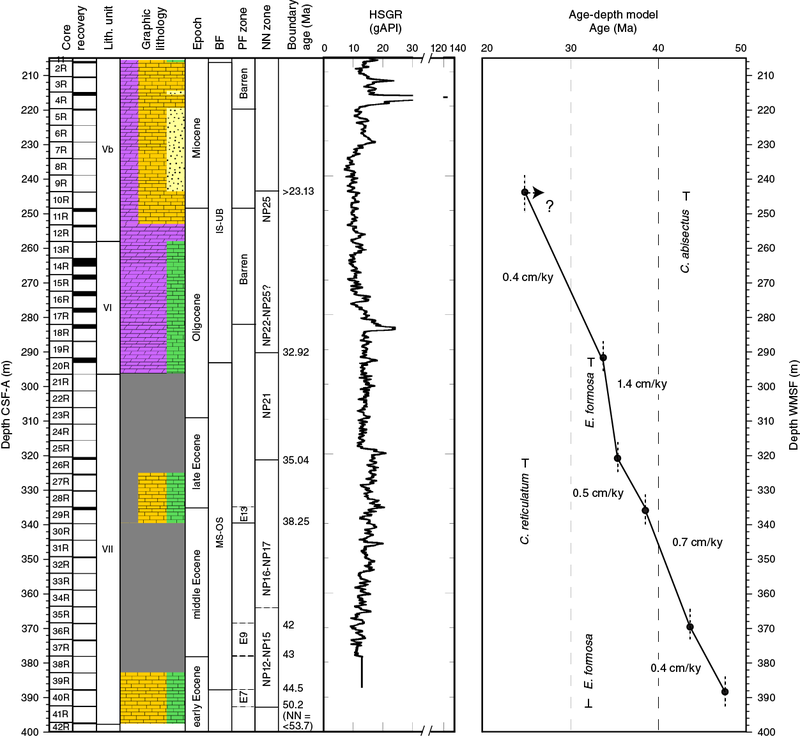 Hole U1459A (Cores 356-U1459A-1F through 14F; 0–70.75 m CSF-A; Table T2) was deposited entirely within the Pliocene–Pleistocene, and Hole U1459B extended the record to the middle Miocene. Hole U1459C (Cores 356-U1459C-2R through 42R; 205.80–397.72 m CSF-A; Table T2) ranged from the Miocene into the early Eocene. Sedimentation rates are between 0.4 and 1.4 cm/ky in the Paleogene (Figures F47, F48). Sedimentation rates are relatively low in the Miocene (<1 cm/ky), very high during the middle Pliocene (nearly 15 cm/ky), and >1 cm/ky in the Pleistocene. Figure F45. Hole U1459A lithology summary with NGR and color reflectance b*. Figure F46. Hole U1459B lithology summary with NGR and color reflectance b*. Figure F47. 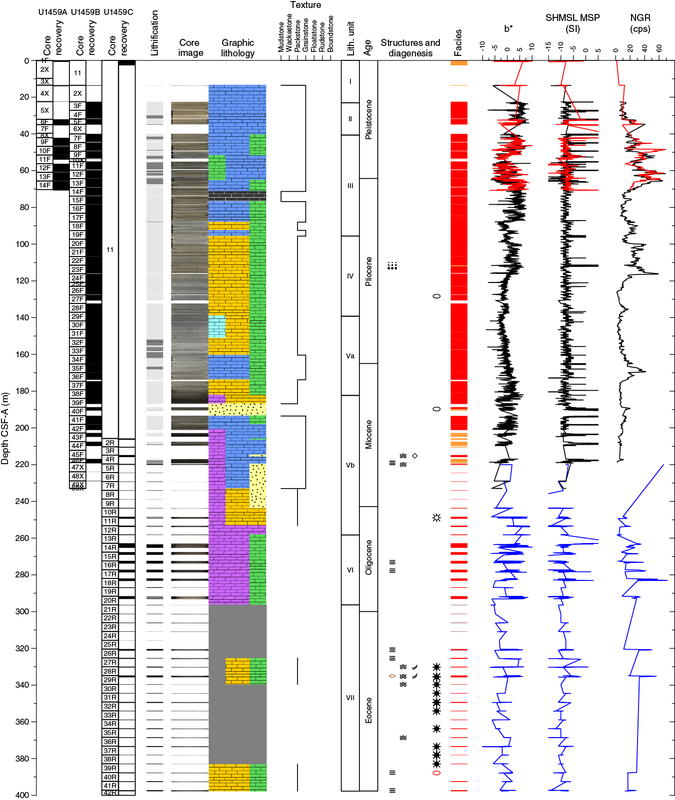 Hole U1459C lithology summary with HSGR wireline log. Figure F48. 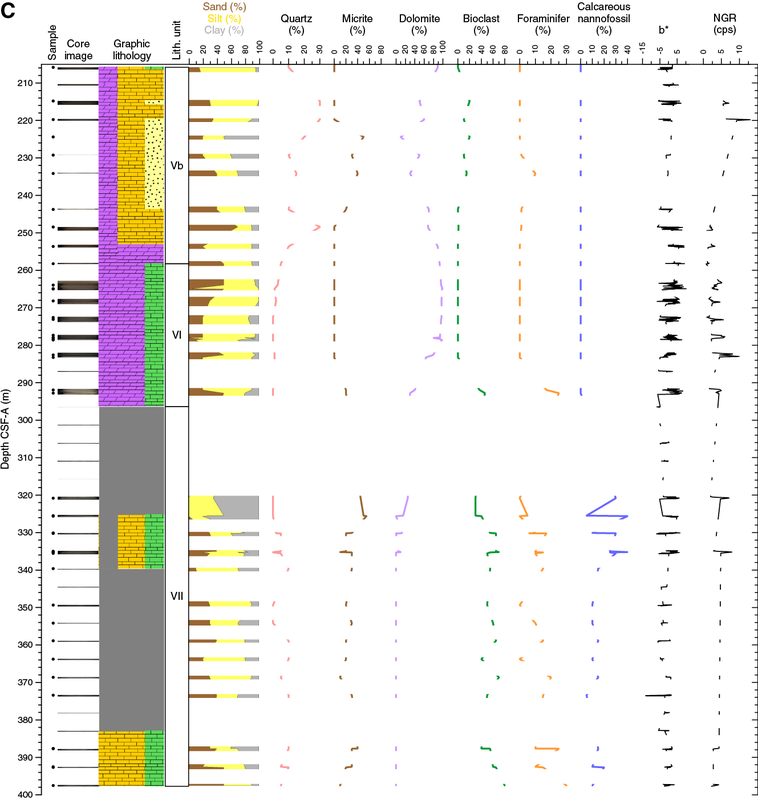 Site U1459 lithology summary with NGR and HSGR wireline log. F4. Lithostratigraphic summary, composite record from Holes U1459B and U1459C. F5. Smear slide summary, Site U1459. F6. Bioturbated skeletal packstones with planktonic and benthic foraminifers, bryozoans, echinoderms, and mollusks. F7. Abundant sponge spicules together with foraminifer fragments and other calcitic skeletal grains in a fine micrite matrix. F8. Moderately to strongly bioturbated foraminifer-rich skeletal packstone. F9. Foraminifer-rich packstones with echinoderms and small amounts of silt-sized glauconite and quartz grains. F10. Sand-sized planktonic and benthic foraminifers together with other skeletal carbonates embedded in a fine micritic matrix. F11. Unlithified skeletal packstone with planktonic and benthic foraminifers. F12. Nonskeletal packstone with abundant peloids. F13. Abundant silt-sized euhedral dolomite crystals in the lower part of Hole U1459B Subunit Va.
F14. Quartz sand–rich interval in the lower part of Hole U1459B. F15. Medium sand-sized calcilithite, with silica cemented throughout. F16. Typical mineralogical composition of Unit VI. F17. Absence of quartz or other lithic grains within sediment in this interval. F18. Highly porous fine to medium crystalline dolostone with glauconite. F19. Nannofossil-rich clay layer showing generally fine, clay- to fine silt–sized clay and micrite grains between abundant nannofossils. F20. 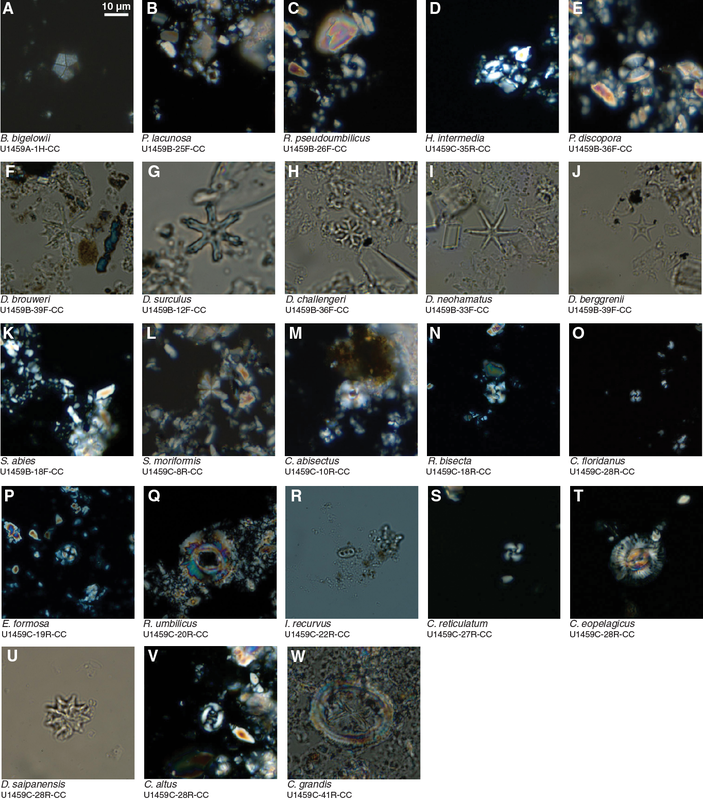 Abundant nannofossils with their distinctive extinction pattern. F21. Chertified dolomitic skeletal limestone. F22. 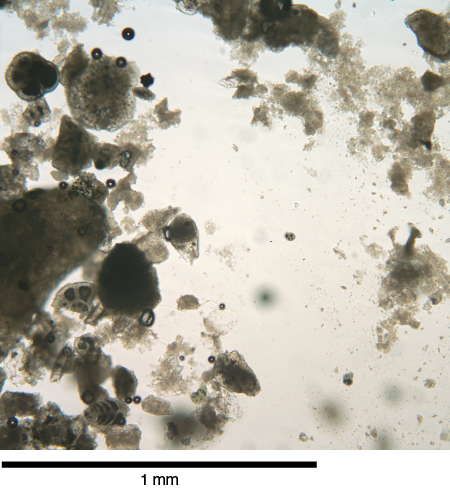 Photomicrographs of calcareous nannofossils, Site U1459. F23. Planktonic foraminifer abundance, Site U1459. F24. Preservation of planktonic foraminifers, Site U1459. F25. Dominant benthic foraminiferal species and assemblages, Hole U1460A. This figure is available in an oversized format. F26. Typical Eocene planktonic foraminifers, including Subbotina sp., Acarinina sp., and Globigerinatheka sp. F27. Benthic foraminifer diversity and benthic percentage of total foraminifers, Site U1459. F28. Hydrocarbons in headspace gases, Site U1459. F29. Alkalinity, pH, and salinity, Site U1459. F30. Major element interstitial water geochemistry, Site U1459. F31. Minor element interstitial water geochemistry, Site U1459. F32. Bulk sediment geochemistry, Site U1459. F33. AF demagnetization results from archive-half SRM measurements. F34. AF demagnetization results for discrete samples. F35. CLG analysis of IRM curve from one discrete sample. F36. 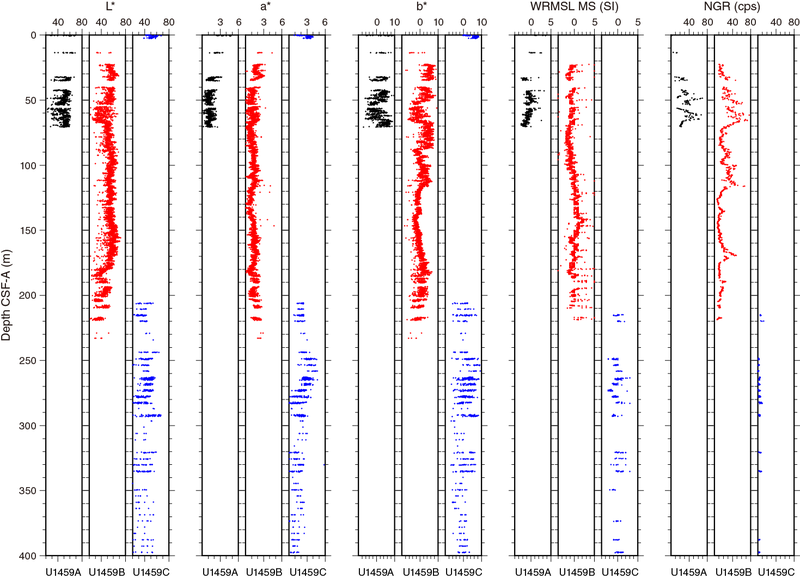 Magnetostratigraphic data set, Hole U1459B. F37. Color reflectance ratios, MS, and NGR results, Site U1459. F38. Bulk density, grain density, porosity, and P-wave velocity, Site U1459. F39. Thermal conductivity, penetrometer, and shear strength results, Site U1459. F40. HSGR, NGR, and elemental U, Th, and K concentrations. F41. MS measured by triple combo, WRMSL MS, and elemental K estimated from HSGR spectra. F42. Representative FMS images, reflecting variations in resistivity through the logged formations, Hole U1459C. F43. Hole U1459C diameter and sonic velocities from Hole U1459B discrete measurements and Hole U1459C wireline. F44. Color reflectance b* correlation between Holes U1459A and U1459B. F45. Hole U1459A lithology summary with NGR and color reflectance b*. F46. 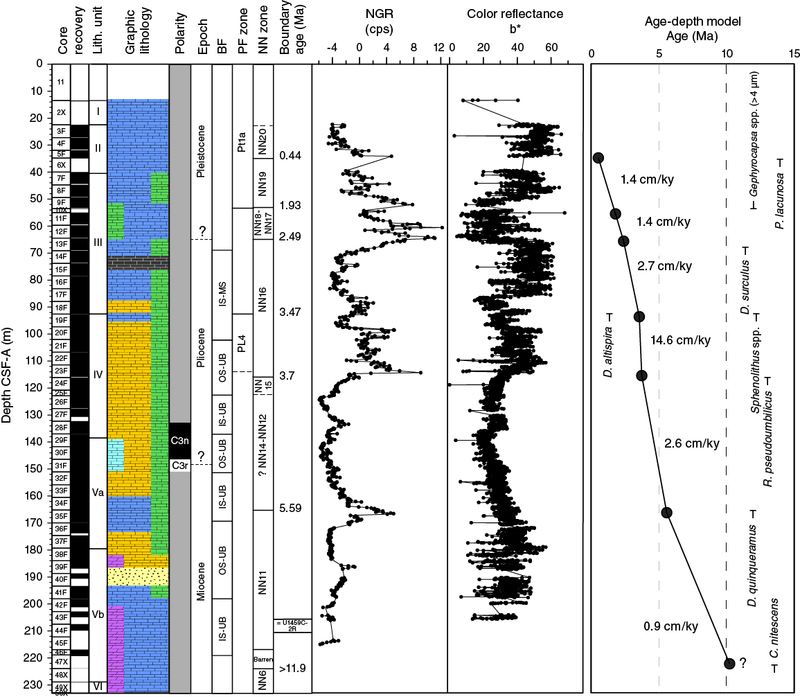 Hole U1459B lithology summary with NGR and color reflectance b*. F47. 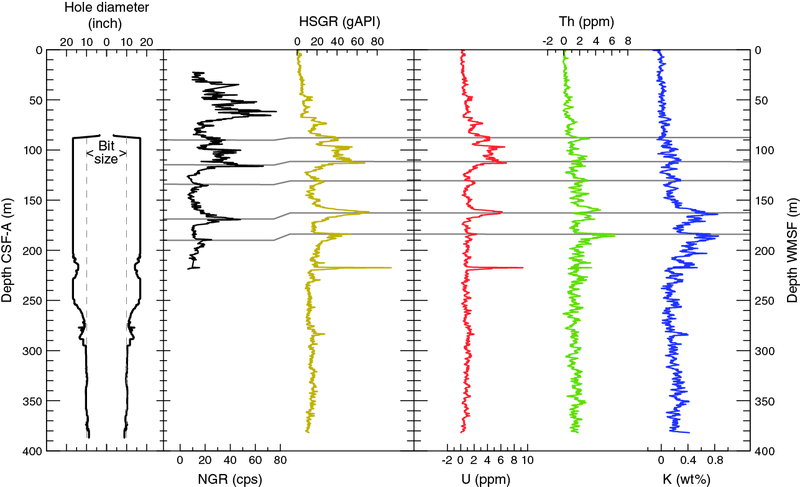 Hole U1459C lithology summary with HSGR wireline log. F48. Site U1459 lithology summary with NGR and HSGR wireline log. T1. Operations summary, Site U1459. T2. Site U1459 core summary. T3. Lithostratigraphic unit summary, Site U1459. T4. Smear slide samples, Site U1459. T5. Thin section samples, Site U1459. T6. XRD analysis of dominant mineral phases, Site U1459. T7. XRF bulk elemental concentrations, Site U1459. T8. Calcareous nannofossil and planktonic foraminifer datums, Site U1459. T9. Calcareous nannofossil abundance and range chart, Site U1459. T10. Main genera and species of benthic and planktonic foraminifers and additional bioclasts and minerals, Site U1459. T11. 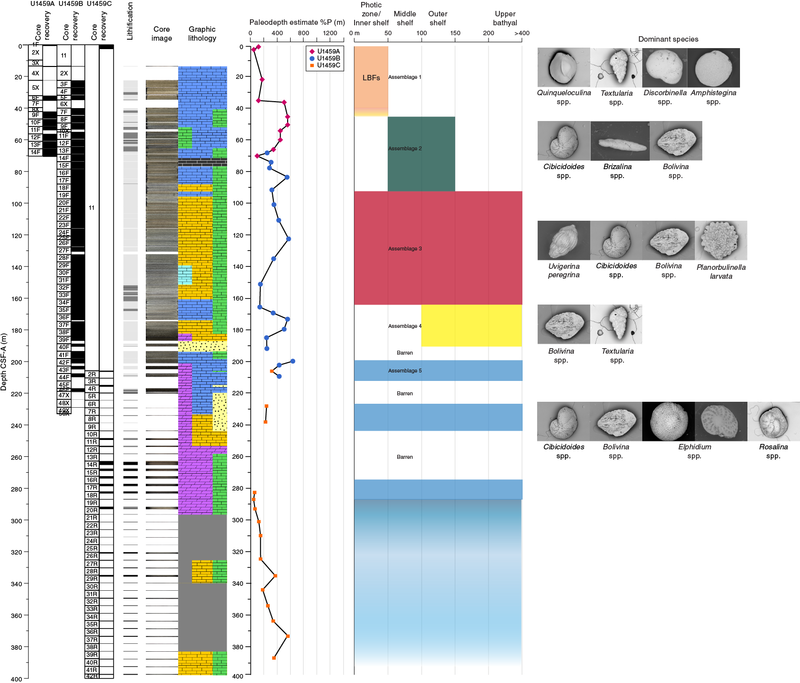 Planktonic foraminifer presence, abundance, and preservation at Site U1459. T12. Benthic foraminifer abundance, Site U1459. T13. Headspace gas contents, Site U1459. T14. P-wave velocity, Site U1459. T15. Impact on sample weight of soaking lithified cube samples in a seawater bath, Site U1459. T16. Affine table, Holes U1459A, U1459B, and the top of Hole U1459C.